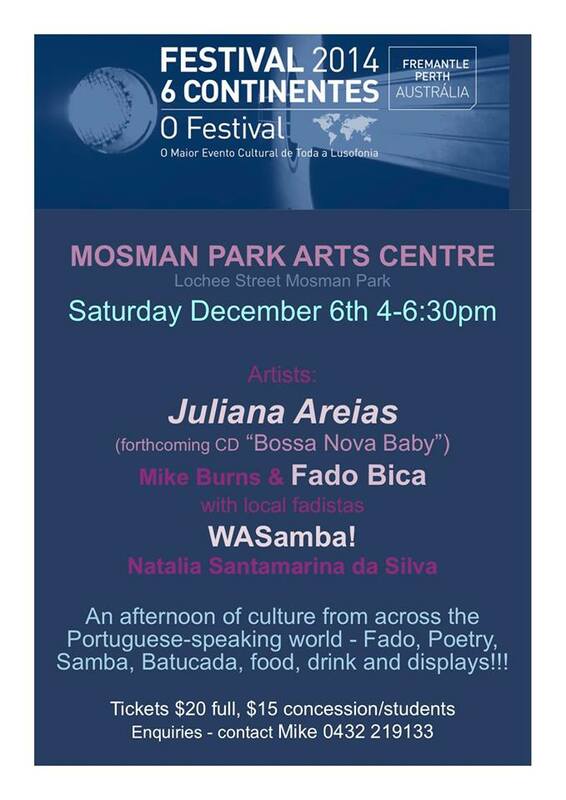 – MELBOURNE – Juliana Areias – Bossa Nova Baby in Concert for the first time in VIC. Date TBC. – PERTH – Fri 6 July – Juliana Areias @ The Ellington Jazz Club – 7pm. Book Now Link coming soon. CANBERRA – Juliana Areias in Concert – Thursday 5 Sept (Date TBC). PERTH – Fri 5 Sept – Juliana Areias @ The Ellington Jazz Club – 7pm. (date TBC). Book Now Link coming soon. – CAPETOWN – Sat 30 Nov – Juliana Areias – Bossa Nova Baby in Concert. (Date TBC). – PERTH – Sat 14 Dec – Juliana Areias @ The Ellington Jazz Club – 7pm. Book Now Link coming soon. 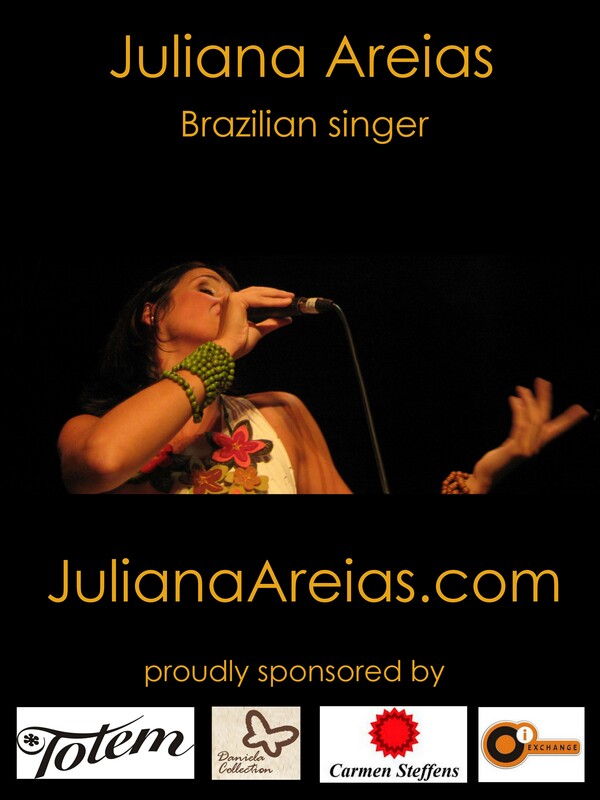 SYDNEY – Sat 6 April – Juliana Areias in Sydney at Foundry 616 Jazz Club – Online booking has finished. Limited tickets only available at the door. Mon 11 to Thu 14 March – Juliana Areias Trio Concert Series at Berrington Aged Care Centres -6.30-8pm in Subiaco and Como – Perth, Western Australia ( invitation required). Sat 3 November – WAM FESTIVAL – #WAMFEST Live 2018 WAMFest – Canon Ball at the Court inside stage – Sat 3 Nov 2018 – 7.30pm – Juliana Areias Trio feat: Joshua de Siva – 7 string guitar and Rafael Medeiros – Brazilian percussion. Free event showcasing artists that are the genuine article, at the peak of their creative powers. This year featuring women from different cultures, ages and walks of life and welcoming all identities, and genders to join together to rejoice and revel in the arts and creativity. The Court Hotel – 50 Beauford St Perth, Australia. – Sat 24 Nov 2018 – Juliana Areias Trio at Cine VIVO ( Queens Building_ 97, William Street CBD Perth (corner with Murray St.) Celebrating 60 years of Bossa Nova, Rita Lee and Lenine’s maracatu. Featuring Joshua de Silva – guitar e Rafael Medeiros – percussion – Book Now. Saturday 20 October – Juliana Areias – Oceano Concert at the Ellington Jazz Club – 7pm. A Musical voyage with songs about the seven seas, iconic beaches, mythic creatures and magic tales of Neptune, Poseidon, Yemanja, sirens, mermaids, pirates, fish-men, African slave ships and Atlantis’s mysteries. JAPAN TOUR – Juliana Areias – Bossa Nova Baby Concerts at the 7th Focus Brazil Press Award in Japan – 60 years of Bossa Nova Celebration. Tuesday 4/9 – Juliana Areias – Bossa Nova Baby Opening show at the Brazilian Embassy in Tokyo – Invitation required. Saturday 8/9 – Focus Brazil Press Award – 60 years of Bossa Nova Celebration at Fukiage Hall – Nagoya, featuring Juliana Areias and 10 bossa nova acts from Japan. 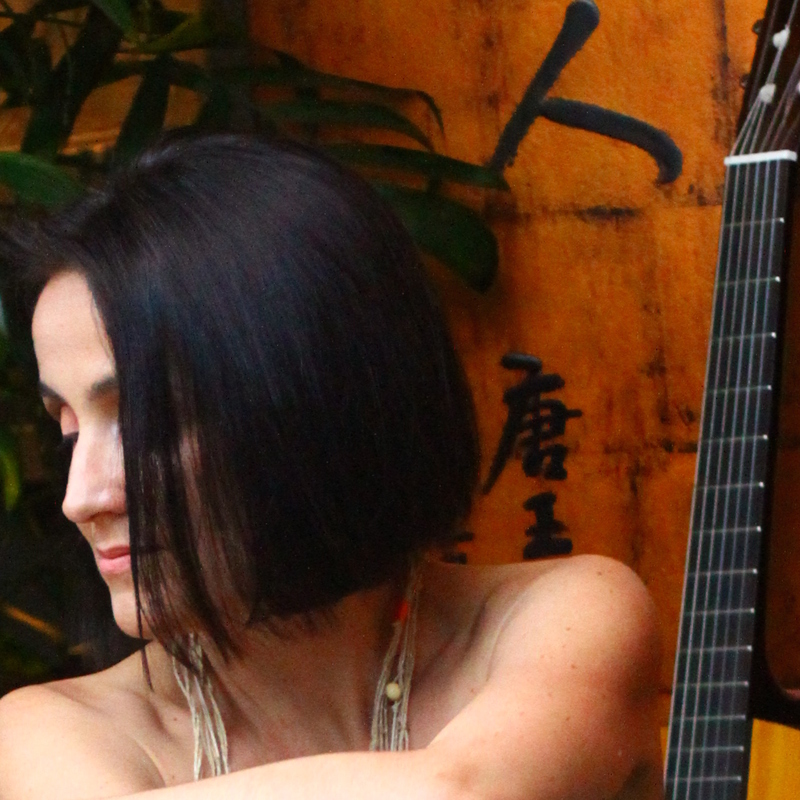 Sunday 9/9 – Grand Finale – Juliana Areias – Bossa Nova Baby Concert at Fukiage Hall, Nagoya. 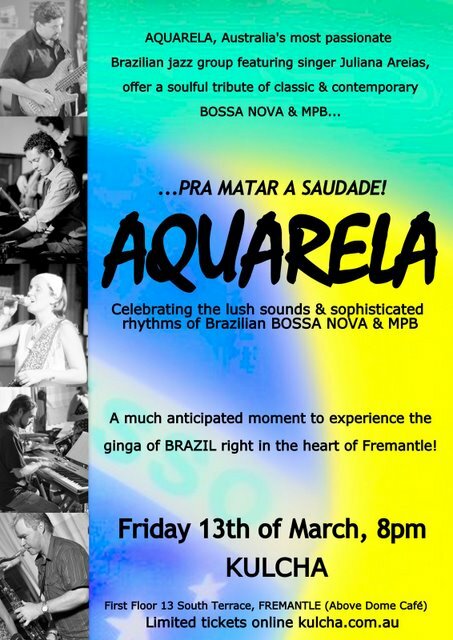 Three nations united – Japan, Australia and Brazil – to celebrate the passion for Bossa Nova and their common language, the music. 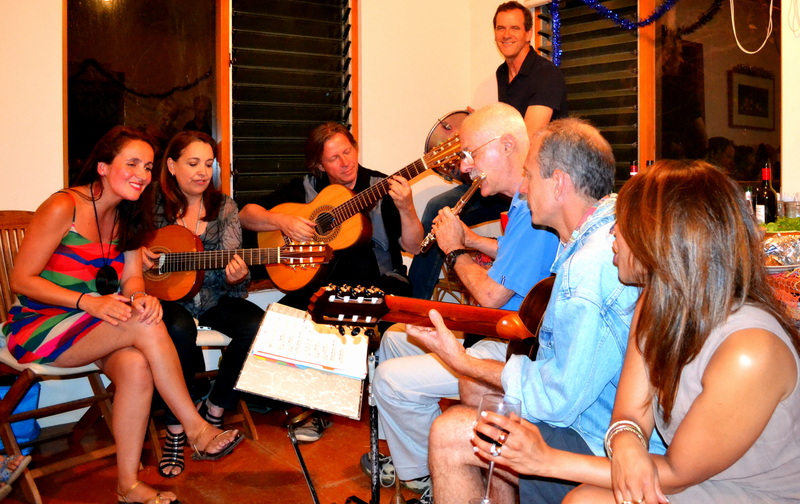 The Bossa Nova Baby Concert features the exuberant original songs of the Bossa Nova Baby album – an infectious blend of bossa-nova with samba, jazz, pop, funk, choro, ballad, and tango rhythms – and exclusive arrangements of well loved Bossa Nova classics such as The Girl From Ipanema, Mas que nada and Waters of March. Band line-ups including: Brazilian born-Perth based singer-songwriterJuliana Areias; Australian born-Tokyo based saxophonist Andy Bevan; Brazilian born-Nagoya based Bassist Beto Beserra, and Japanese musicians: pianist Shinobu Wakayama (Yamaha endorsed artist); flutist Manabu Suzuki, guitarists Komori Atsushi and Hiroshi Makanuma; bassist Naoto Tanii and drummer Hideki Shibata. Sunday 23 September – WAM & Perth Royal show presents Juliana Areias – Bossa Nova Baby original songs with guitarist Mark Shanaham at – 12pm at the Perth Royal Show main stage for 40 minutes ( The Show Ground -Small business Lawn) and 1.30pm at the Gate 1 Stage for 20 minutes . Info and tickets. Sat 14 July – Bastille Day show at Fremantle Royal Golf Club 7-11.30pm (invitation only). Wed 25 July – City of Perth Winter Festival and WAM present Juliana Areias at the Winter Sounds Series – 12.30-1.30pm at Enex – Level 3, 683 Hay St. Free . – SAT 12/5 – Brazil Focus Press Awards 2018 – Celebrating 60 years of Bossa Nova – 7- 11pm – at the Broward Center for the Performing Arts – Fort Lauderdale – Book Now. – SAT 9/6 – Westgate Hotel – 8-11pm – Juliana Areias Trio featuring pianianist Rob Whitlock and drummer Claudio Rochat-Felix. Special thanks to Allison adams Tucker. – Fri 15/6 – Bickford Theatre – Morris Museum – 8pm Bossa Nova Baby show and CD Launch celebrating 60 years of Bossa Nova. Book Now . Featuring Wesley Amorim – guitars, Oriente Lopez – piano, Itaiguara Brandao – bass, Samuel Martinelle – drums and Jorge Continentino – sax/flute. – Wed 28/3 – United Nations Jazz Society – 7-9pm feat Debbie Goodridge – UNSRC . Invitation required. –Sun 1/4 – Spontaneous Jam with Bobby McFerrin at the Blue Note – NYC during his show “Spirityouall” – thank you for the opportunity. Featuring Wesley Amorim – guitars, Oriente Lopez – piano, Peter Slavov – bass, Luiz Monica Ebert – drums and Jorge Continentino – sax/flute. Featuring Oriente Lopez – piano, Itaiguara Brandao – bass, Samuel Martinelle – drums and Jorge Continentino – sax/flute. – SAT 4 NOVEMBER – WAM FEST 2017 – Juliana Areias Show feat. guitarist Mark Shanaham . 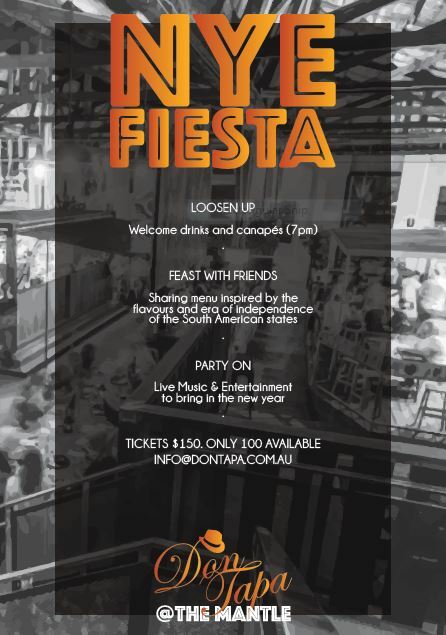 Venue: The Laneway Lounge ( 414A Murray St, Perth_ – 7.20pm-8pm. Free. 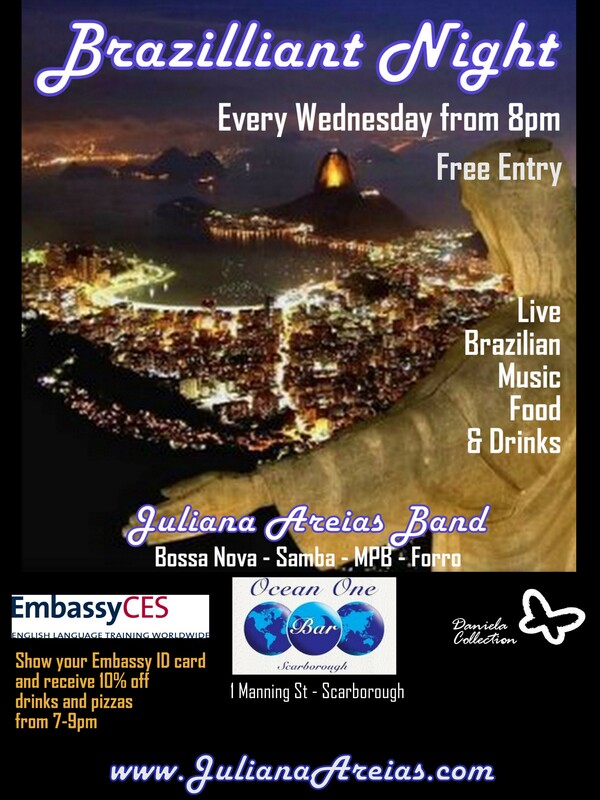 WED 4 October – Forro at Oceans 6019 – Special night with Juliana Areias and Xoxote Band. SAT 24 October – Juliana Areias & Mark Shanaham at The Mezz – Mt Howthorn – 6-8pm. MONDAY 14 August – 6.45pm – 9. 30pm – Monday Supper Club – An intimate evening of simple food, fine music and great words – feat, Juliana Areias & Mark Shanahan Duo – Sounds of Brazil, poetry by Vivienne Glance, dinner, and corkage (BYO alcohol only.) in the Historical Maylands Building – Dome Cafe. $45 – Book now. (only 45 seats). FRIDAY 21 JULY 2017 – 7pm at The Ellington Jazz Club – 7pm Juliana Areias – Bossa Nova Baby in Concert – Book Now. 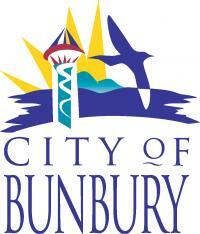 Fri 12/5 Juliana Areias Duo at The Boulevand Centre – City of Cambridge – 7pm. 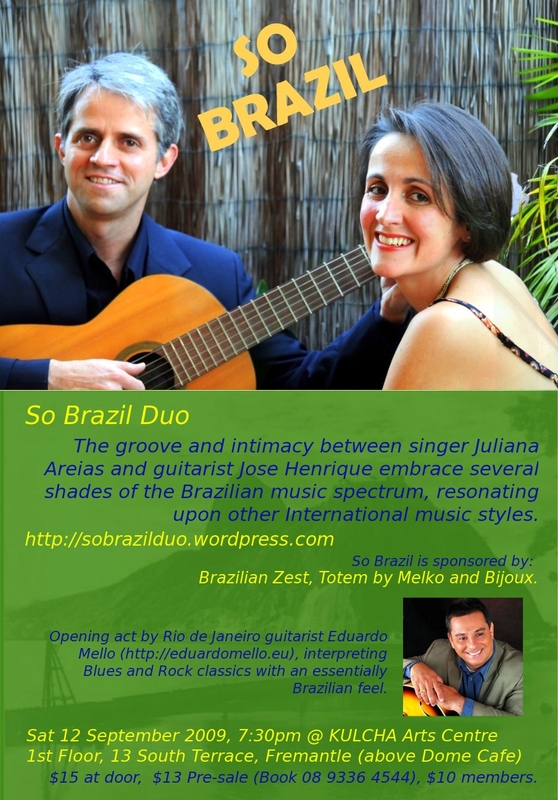 Sunday 12/2 – Beyond Bossa Show – Juliana Areias and Mike Bevan quartet (Perth – Brazil – Adelaide) at Jazz Fremantle 4-7pm. Featuring Paul Millard – sax/flute and Mike Boase – drums . When the “fathers” of Bossa Nova ( Antonio Carlos Jobim) and Chorinho ( Pixinguinha) meet. A stunning afternoon of cool jazz, summer sambas, breezy bossas and captivating choros – Brazil’s most sophisticated musical genre, the precursor of samba – authentically performed by Mike in a seven strings guitar. Preço: R$ 40 (pagamento em dinheiro na porta. Para reservas e informação: cristina.lages@gmail.com Cel + 55 11 98433-5733 ( Bossa Nova Club- Bossa Nova Productions). SALVADOR – 7 Jan 2017 as 18h – Convidada especial do Jam no Mam – Museu de Arte Moderna da Bahia. (Solar do Unhao – Avenida do Contorno, s/n – Comercio, Salvador ). Entrada livre. FORTALEZA – 9-23 Jan 2017 (TV and Radio performances and interviews only). Estreia da Série Brasilidades do Bossa Nova Productions, que recebe de braços abertos Juliana Areias, a cantora e compositora brasileira, que é sucesso na Austrália com seu álbum autoral “Bossa Nova Baby”. No repertório do show, as 12 faixas originais do álbum, — um mix muito interessante de jazz, funk americano, tango, choro, pop e, claro, muita bossa nova — compostas com parceiros do Brasil, Europa, Austrália e Nova Zelândia, e mais quatro deliciosos arranjos para clássicos como “Garota de Ipanema”, “Águas de Março” e “Rio”. Juliana Areias, a Bossa Nova Baby, já passou pelos palcos do Montreux Jazz Festival, Sydney Opera House e Ronnie Scoot Jazz Club de Londres, além de ser presença constante nas rádios da Austrália. A artista é finalista de prêmios de música australianos nas categorias World Music/Latin Jazz e Melhor Canção do Ano, tanto com “Flecha” quanto com “Maré Cheia”. Essas canções e as demais faixas do álbum podem ser ouvidas em www.julianaareias.com. Em São Paulo apresentação única com músicos convidados da Orquestra de Jazz Sinfônica de São Paulo: Chico Macedo (sax/flauta), Marcelo Guelfi (piano), Dino Barioni (violão e violão sete cordas), Rubens De Donno (contra-baixo) e Ramon Montagner (bateria). No Rio de Janeiro, apresentação única com músicos convidados: Jose Carlos Bigorna ( sax/ flauta), Natan Gomes ( teclados), Humberto Mirabelli ( violão e guitarra), Rodrigo Villa ( baixo) e Victor Bertrami (bateria). An evening of passion and elegance, celebrating timeless Latin Jazz Classics and European Languages in Perth. Sat 12 Oct – Juliana Areias duo at Hyde Park 1pm – Greens Unity Picnic. – Wed 14 September – Special guest of Ocean One Bar Scarborough’s Forro Night with Danilo da Paz, Dance Ablett, Fabio Macarrao ( Xoxote Band) and Salomao Falci – 8.30-11.30pm. – Fri 3 June 2016 – CAIRNS – Jazz Up North Series – Tanks Arts Centre – Cairns – 7.30pm – Book Now. – Sunday 21 Feb – Juliana Areias Duo @ Juan Rando Dance Academy – Open Day. – Sat 2 Jan 2016 – DENMARK – Saxy weekeend at Rockcliffe Winery – 5-8pm. FREE. (18 Hamilton Road, Denmark WA). 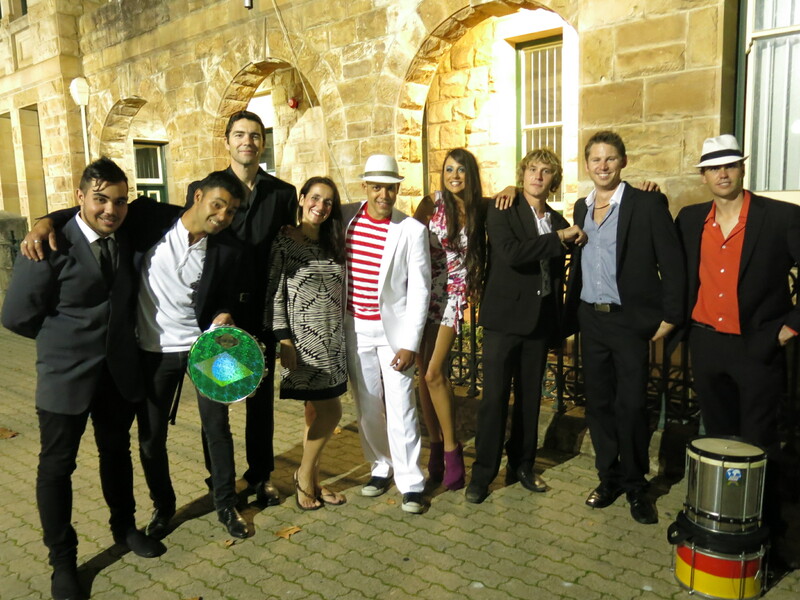 – Thu 5 Nov 2015 – WAMi – Western Australian Music Awards – “Best World Music Act” nominee . 8.30pm (by invitation only). – Saturday 17/10 – Supporting O Festival 6 Continentes – Portuguese Global event, Perth Edition. 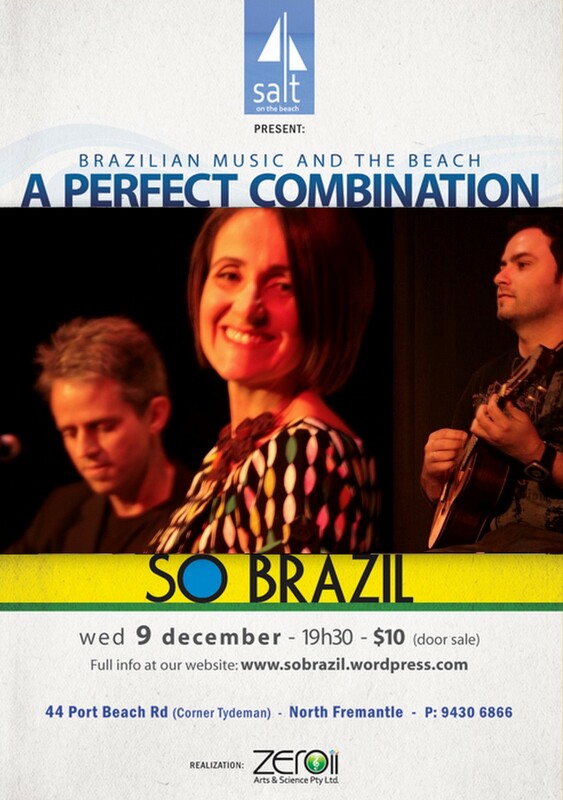 – Tuesday 8/9 – Sydney Opera House- Official celebration of 70 years of Diplomatic relationship between Australia and Brazil featuring Juliana Areias – Bossa Nova Baby 7 piece band – ( by invitation only). – Saturday 8/8 – CINE VIVO – Perth’s Latin American Film Festival – Opening night feat Juliana Areias trio and Brazilian Film. – Friday 28/8 – Perth Samba Social Club – at The Ellington Jazz Club – 10.30pm featuring Marcio Mendes, Thiago Santos, Juliana Areias, Juliana Frassatti, Fabio Macarrao, Sergio Maia Garrido. 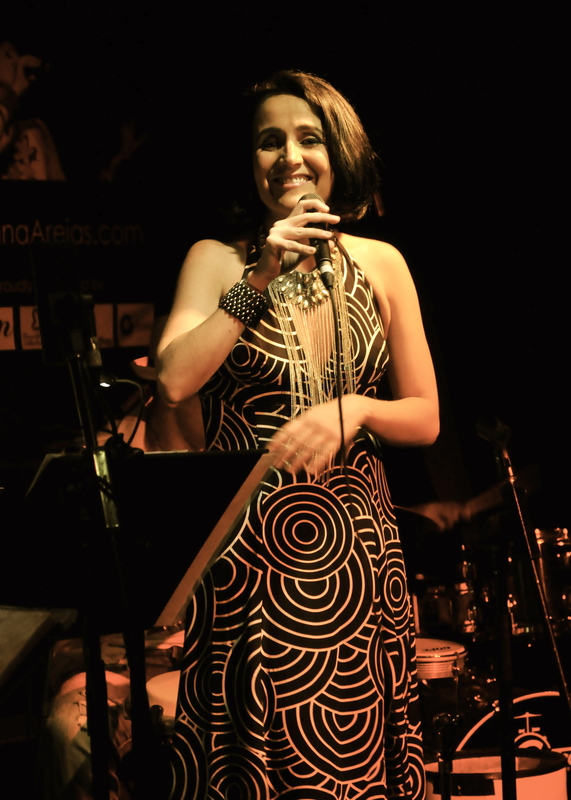 – Thursday 21/5 – 7.30pm -10.30 – Juliana Areias Trio at Laneway Lounge. – Saturday 2/5 – 6.15pm -8.45pm – Juliana Areias Duo at Laneway Lounge. 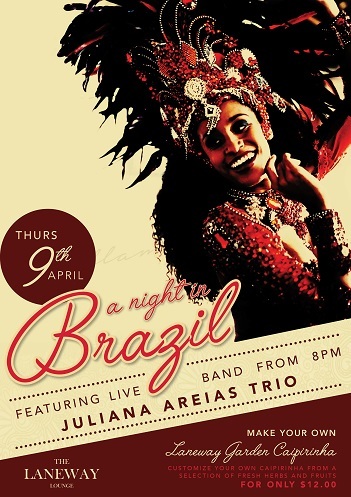 – Thursday 9 April – 7.30pm-10.30pm – Juliana Areias Trio – Brazilian Night at Laneway Lounge. – Thursday 2, 16 April – SUNSET SONGS @ The Kiosk Floreat Beach ( Challenger Parade – ph:92850048 ) – 6.30- 8pm feat. Juliana Areias duo with Gus Potenza. 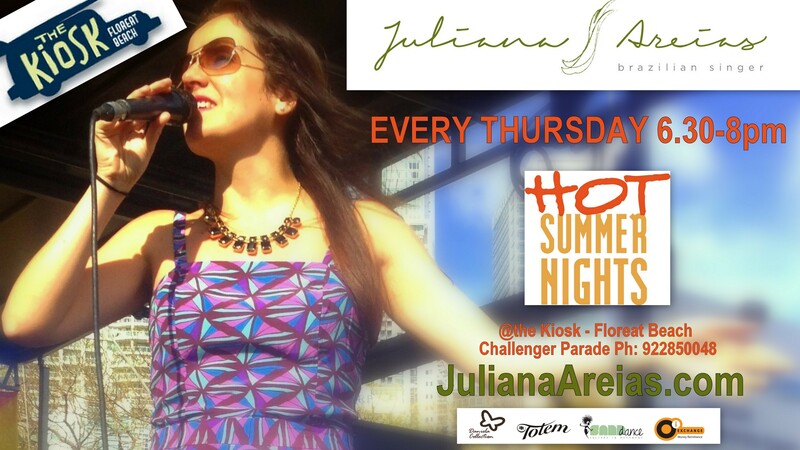 – Thursday 12 March – 6-9pm – Juliana Areias Trio at Claremont Quarter’s Mediterranean Night Kitchen Square. – Every Thursday – SUNSET SONGS @ The Kiosk Floreat Beach ( Challenger Parade – ph:92850048 ) – 6.30- 8pm feat. Juliana Areias duo with Gus Potenza. 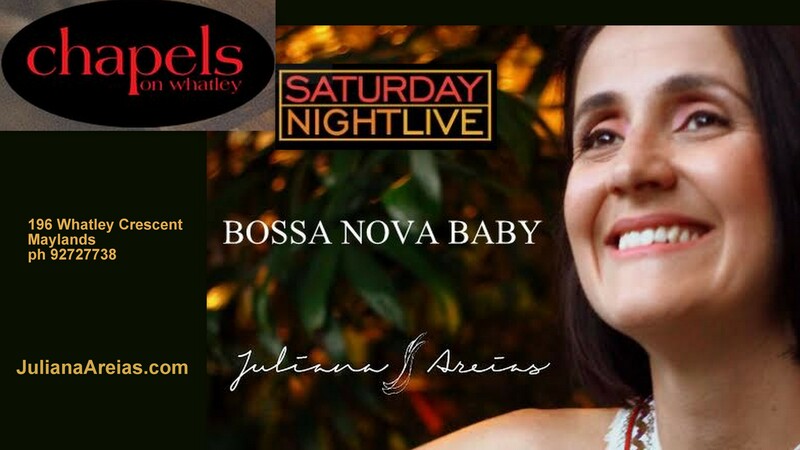 – Saturday 7 February – Juliana Areias – Bossa Nova Baby Album – Official Launch – BOOK NOW . SOLD OUT Featuring: Graham Wood – piano, Ray Walker – Guitar, Marcio Mendes – guitar/percussion, Pete Jeavons – bass, Chris Tarr – drums, Paul Millard- Sax/flute, Jeremy Greig and Special guests Thiago Santos, Cathie Travers and Zak Rowntree. – Preparation for the Bossa Nova Baby CD Launch ( 7/2 – BOOK NOW ) . SOLD OUT . – Every Thursday – SUNSET SONGS @ The Kiosk Floreat Beach ( Challenger Parade – ph:92850048 ) – 6.30- 8pm feat. Juliana Areias duo with Gus Potenza. ( excluding 1/1 – New Year’s day). – Sunday 18 January – Sunday Session at the Bassendean Hotel – 5-7.30pm – Juliana Areias duo with Gus Potenza. – Every Thursday – SUNSET SONGS @ The Kiosk Floreat Beach ( Challenger Parade – ph:92850048 ) – 6.30- 8pm feat. Juliana Areias duo with Gus Potenza. ( excluding Thursday 25/12 – Christmas day). 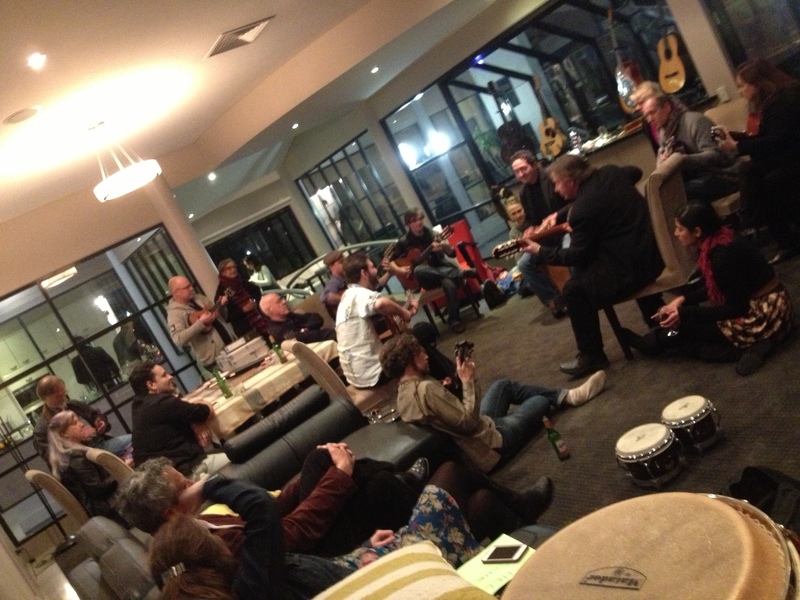 – Every Saturday – Juliana Areias duo at Chapels on Whatley – 7-9.30pm ( 196 Whatley Crescent, Maylands . Bookings: 9272 7738 ). – Sunday 28 December – Sunday Session at the Bassendean Hotel – 5-7.30pm – Juliana Areias duo. – Sunday 7 December – Sunday Session at the Bassendean Hotel – 5-7.30pm – Juliana Areias duo with Gus Potenza. – Friday 6 December – Juliana Areias , representing Australia at “6 Continents Festival” ( Festival 6 Continentes – O Festival – Internacional da musica lusofona) – A worldwide festival celebrating Portuguese Language Music simultaneously. From 4 – 7pm at MosArts at Camelot (12-16 Lockee St Mosman Park). Also featuring Fado Bica, WASamba and more. 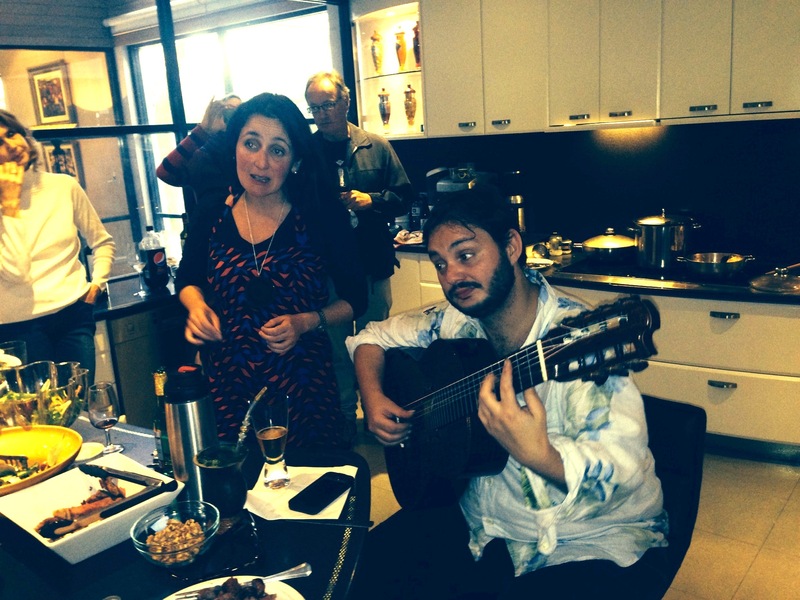 Event supported in Brazil by Paula Morelenbaum and Danilo Caymmi. – Wednesday 3 December – Juliana Areias exclusive performance at Enex 100 – Sculpting Style by Zoe Bradley – Magenta Exhibition Opening Breakfast Event – 8-9am . (only by invitation). 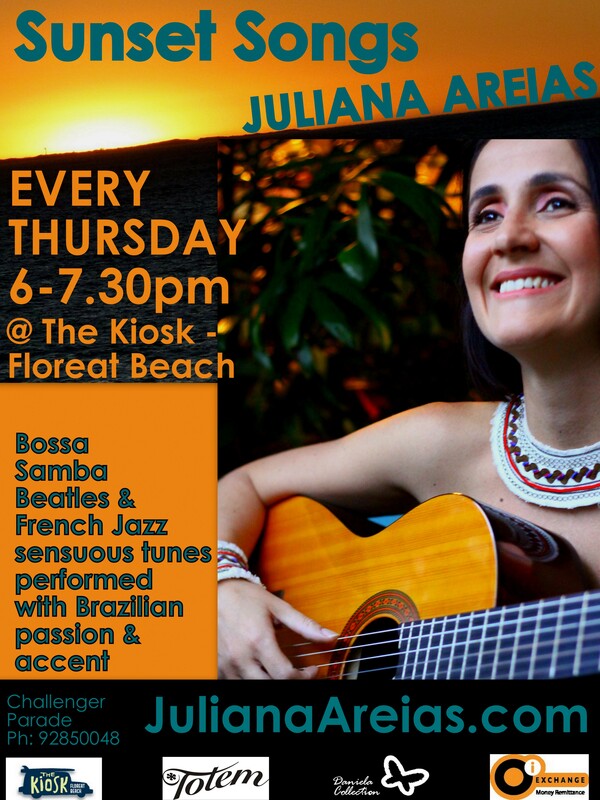 – Wednesday 3 December – Private Bossa function – featuring Juliana Areias and Mark Shanahan at The Kiosk Floreat Beach. 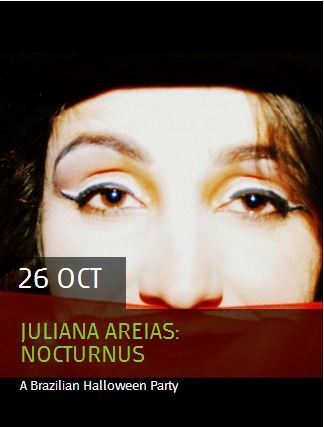 – Friday 31 October – Juliana Areias quartet – Nocturnus – Brazilian Halloween show at Mandurah Performing Arts Centre – Foyer as part of the Mandjar 9×5 Dinner . Doors open 6pm. Show starts 7.15pm – . Event produced by Mandurah Performing Arts Centre and Alcoa Mandurah Art Gallery celebrating the 2014 Mandjar 9X5 Art Auction dinner and live entertainment on Friday 31st October at 6.30pm. Dinner is a two course meal with a vegetarian option and complimentary glass of wine. Come and join us for an evening of fine dining and great music culminating in an exciting art auction at 8pm of quality framed 9X5 artworks by outstanding artists from the Peel Region. Book now Tickets $50. SYDNEY TOUR – Thursday 16 October at 505 – Pipoca Moderna Gathering – feat. Abuka and Juliana Areias – feat: Tiago De Lucca (voice/guitar), Sandro Bueno (percussion), Jonathan Zwartz (bass), Daniel Pliner (piano), Bruno Silveira (drums), Raphael Brazil – Vibez Brazil (DJ). – Saturday 4 October – Juliana Areias duo at Chapels on Whatley – 7-9.30pm ( 196 Whatley Crescent, Maylands . Bookings: 9272 7738 ). – Friday 3 October – Juliana Areias duo at Chapels on Whatley – 7-9.30pm ( 196 Whatley Crescent, Maylands . Bookings: 9272 7738 ). 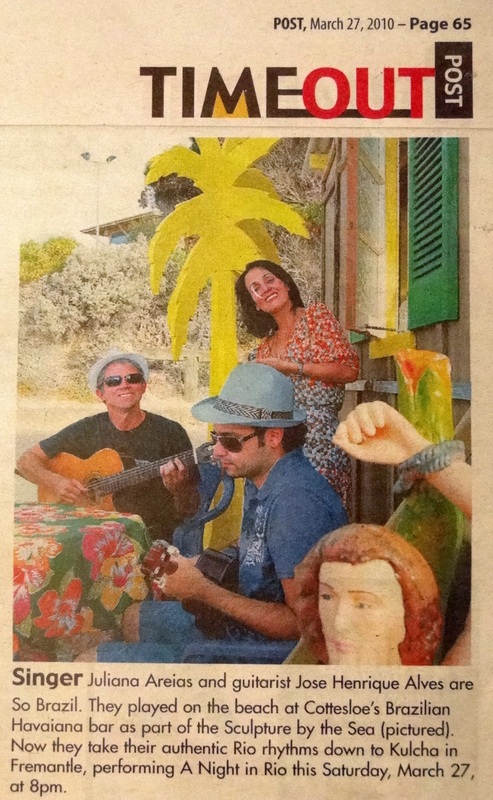 – From 2/10- EVERY THURSDAY- SUNSET SONGS @ The Kiosk Floreat Beach ( Challenger Parade – ph:92850048 ) – 6.30- 8pm feat. Juliana Areias duo with Gus Potenza. It’s not hard to see why Juliana Areias is doing sell-out shows around Australia, with her exotic Brazilian heritage and passionate voice. After concert – Special guest at “Feijoada com Samba” – Terrace Hotel ( 237, St George Terrace) to have a “Feijoada com Samba” afternoon of Live Samba Music and typical Brazilian Food ( until 6pm). 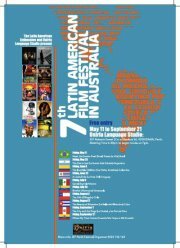 – Saturday 20 September – Juliana Areias Trio at the 10th Latin American Film Festival – by Cine Vivo – 9-10pm ( Tranby Hall, 1st Floor, Queen’s Building 97 William St corner Murray St, PERTH CBD) . “Brazilian Day” is an annual festival which takes place in New York, Montreal, London, Tokyo and other metropolis around the world to celebrate Brazil’s Independence Day – September 7th. Come and enjoy three Brazilian singers Marcio Mendes, Gus Potenza and Juliana Areias performing all together for the first time to bring to you the full spirit of Brazilian music with all its multiple influences ranging from pop rock, blues , jazz and soul to samba, maracatu, baiao and bossa nova. It’s time to party Brazilian style! – Wed 3 September – Juliana Areias Duo – Exclusive Metropol Infinity Suite – Crown Casino Mansion – Rum and Cigar night. – 7-9pm ( for invited only). Feat. Guitarist Mark Shanaham. – Friday 22 August – Special guest of “Marcio Mendes and friends” – show celebrating his birthday at the Ellington Jazz Club – 10.30pm . – Saturday 19 July – in Adelaide – Jam session – roda with Yamandu Costa ( Adelaide International Guitar Festival), Doug de Vries, Heloisa McMillan, Juliana Areias, Luciana Negrao, Glen McMillan, Gabriela McMillan, Mike Bevan, Adam May, Julian Scheffer, Paul Carey, Geoffrey Drake-Brockman, Carlos Fausto S. Brito, Kay Ann Sullivan, Miriam Butler, Fabian Hevia and some more. Private party. – Sunday 25 May – La vie en rose in Ipanema – Juliana Areias, Ray Walker & Cathie Travers @ Laneway Lounge presented by The Perth Jazz Society. – Sunday 18 May – Juliana Areias & Mark Shanaham at Lapa BBQ Armandale. 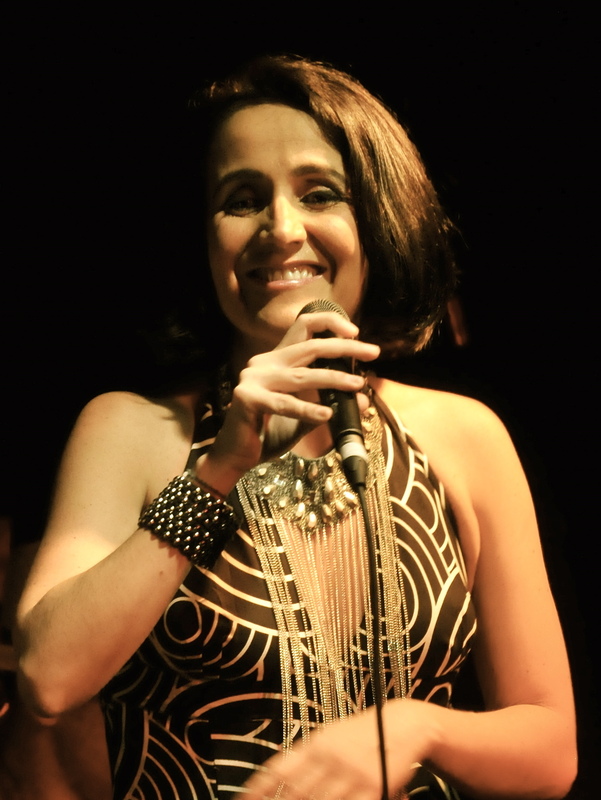 – Friday 16 May – Special guest at Marcio Mendes and Saramandaia at the Ellington Jazz Club – 7pm. 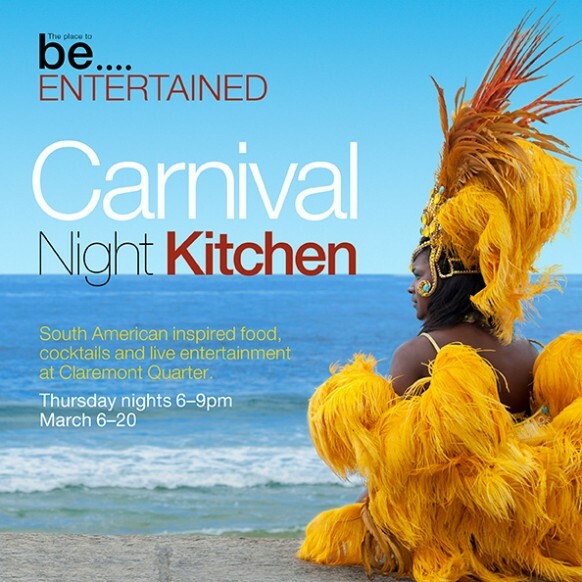 – Thursdays 6th and 20th March – Opening and closing of Claremont Quarter’s Carnaval Kitchen Nights. Opening on 6/3 -6-8pm feat. Juliana Areias duo in the Lane area. Closing on 20/3 feat. 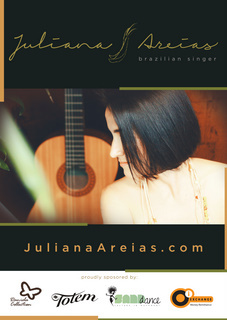 Juliana Areias trio: 6-9pm in the Lane area. 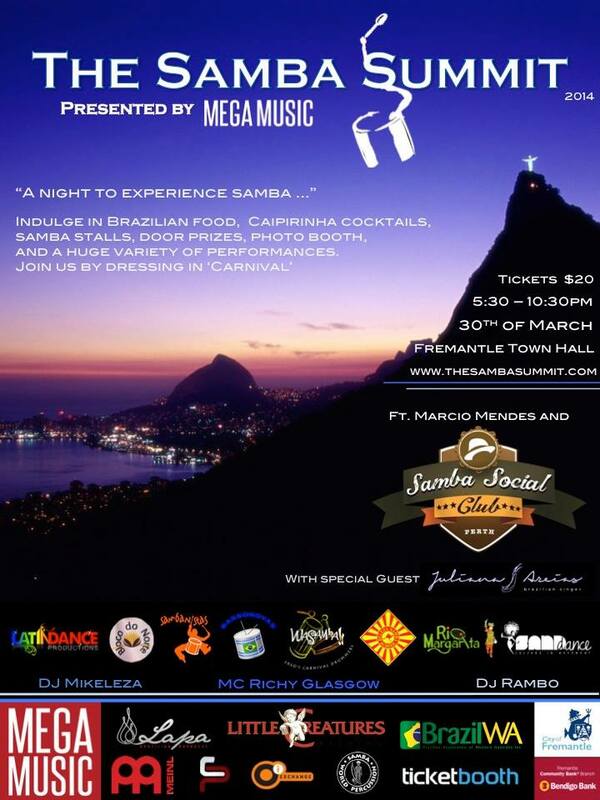 – Sunday 30 March – from 6pm – SAMBA SUMMIT – at Fremantle Town Hall – 5.30pm-10.30pm – featuring Perth Samba Social Club with special guest Juliana Areias and all WA Samba Schools united: Beleza School of Samba, WASamba, Sambanistas, Bassonovas, Bloco do Norte, Rio Margarita. ; Plus DJ Mikeleza, DJ Rambo, MC Ricky Glasgow. Food and drinks and goods stalls. Event presented by Mega Music. Produced by WASamba – Ben Bowtell. 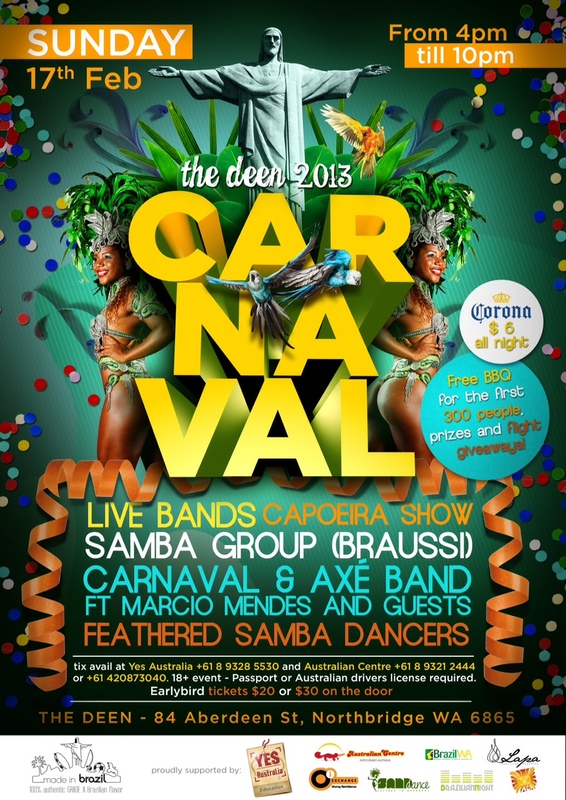 – Saturday 1 March – Supporting Perth’s Official Carnaval Party. 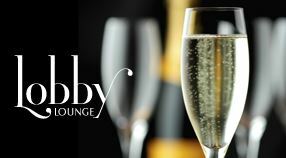 From 10pm to 5 am @ VILLA ( 187 Stirling St – Perth) . 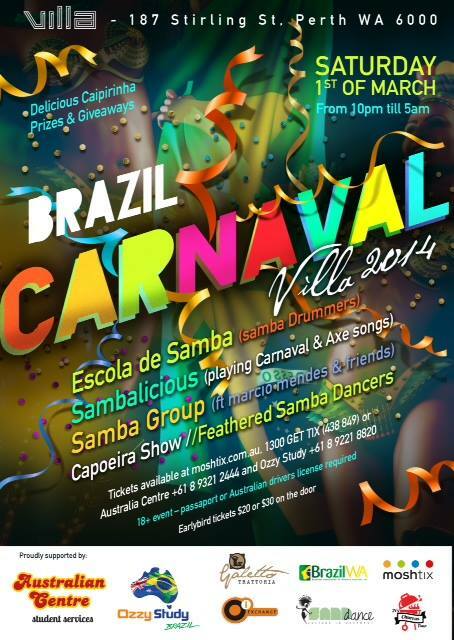 Featuring: Sambalicious, Marcio Mendes’ samba group, Samba Drummers, Samba Dancers , Capoeira , food and drinks stalls. 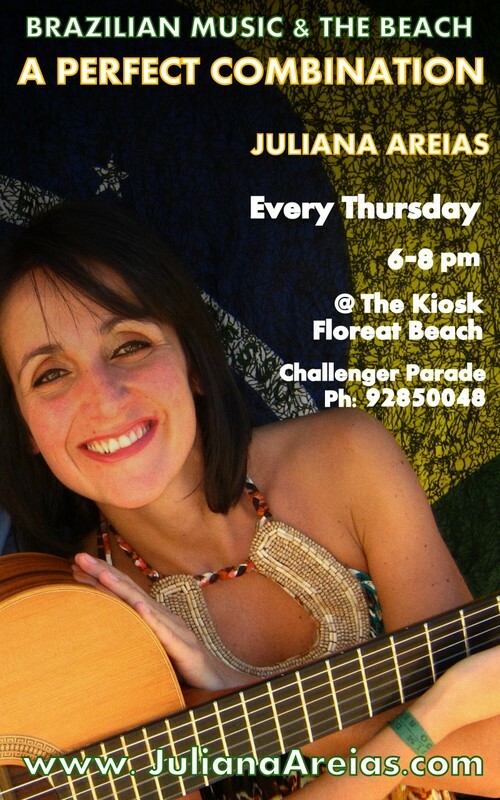 – Every Thursday – 6.30-8pm – Juliana Areias Duo @ The Kiosk Floreat Beach – Sunset Song Summer Season ( Challenger Parade – ph:92850048 ). – Saturday 22 February – Juliana Areias and Gus Potenza performance appearance at 2014 first All Stars Party at JRDA – Juan Rando Dance Academy. From 8pm ( 296 Churchill Ave. Subiaco). Ph:93823235. -Friday 7 February – Juliana Areias’s birthday Show – “MARE CHEIA”: On the Rise @ Ellington Jazz Club – Book Now – Bossa Nova classic and Exclusive Original songs which are going to be recorded on 2014. Featuring Graham Wood ( piano), Marcio Mendes ( guitar and percussion), Paul Millard ( sax/flute), Pete Jeavons (double bass) and Chris Tarr ( Drums). – Sunday 26 January – AUSTRALIAN DAY – SUMMERSET ART FESTIVAL 2014 – AUSTRALIAN DAY – WA ZOUK Present ROOFTOP SAMBA/ TANGO @ The Esplanade – Scarborough Beach . From 4.30pm Tango +Live Music feat. 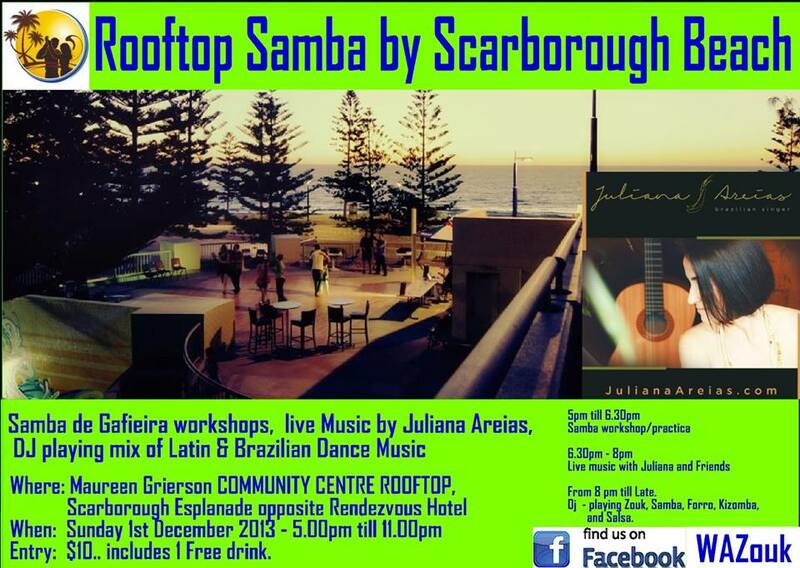 Juliana Areias & friends (6.30pm) + DJ Jelena (tango,samba,forro, zouk, Kizomba) @ Maureen Grierson Community Recreation Centre Rooftop Scarborough Esplanade – Beach foreshore, opposite Rendezvous Hotel. ). $10 tickets on the door. See Samba Style WA for information about Samba de Gafieira free lessons, social practices and activities. – Tuesday 31 Dec 2013 to Thursday 9 Jan 2014 – in Adelaide. – Saturday 28 December -1-3pm – every last Saturday of the month – Juliana Areias Duo at the Gypsy Tapas House ( Highgate Court, 124 High St – Cnr Queen St- Fremantle. Phone: 9336 7135) – 7-9 pm. Feat: Mark Shanahan-guitar. – Tuesday 17 December – Saffron Sharp & Juliana Areias @ Laneway Lounge presented by the Perth Jazz Society – Woman in Jazz – 7pm (414A Murray Street 6000 Perth T: (08) 9321 2508 ). 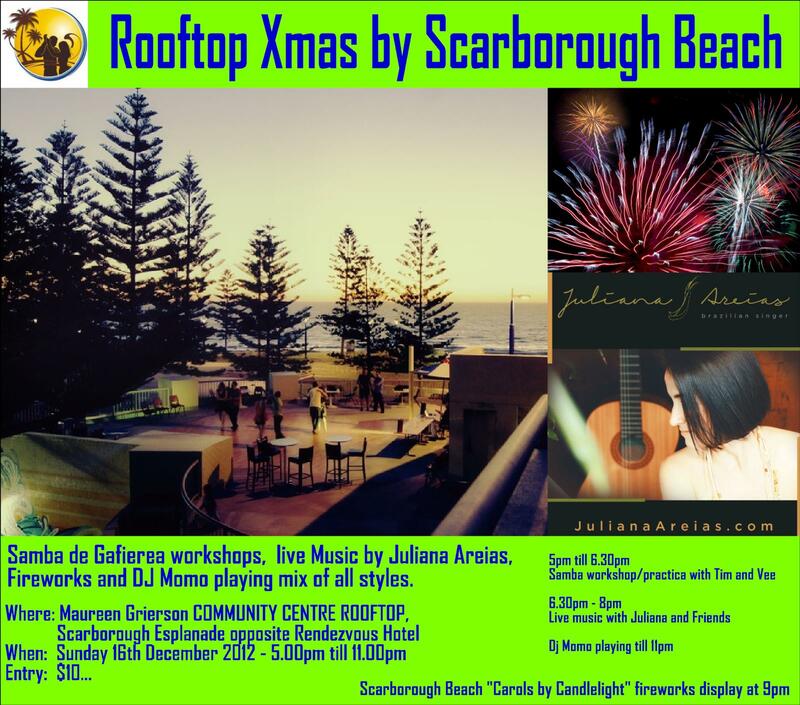 – Sunday 15 December – ROOFTOP SAMBA + XMAS FIREWORKS and carols Edition @ The Esplanade – Scarborough Beach . Samba de gafiera workshop (5pm) +Live Music feat. Juliana Areias & friends (6.30pm) + DJ Momo (zouk, salsa and more) @ Maureen Grierson Community Recreation Centre Rooftop Scarborough Esplanade – Beach foreshore, opposite Rendezvous Hotel. ). $10 tickets on the door. See Samba Style WA for information about Samba de Gafieira free lessons, social practices and activities. 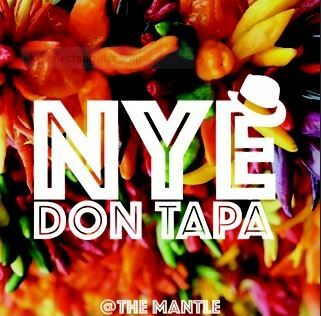 – Sunday 1 December – ROOFTOP SAMBA / TANGO @ The Esplanade – Scarborough Beach . From 4.30pm Tango +Live Music feat. 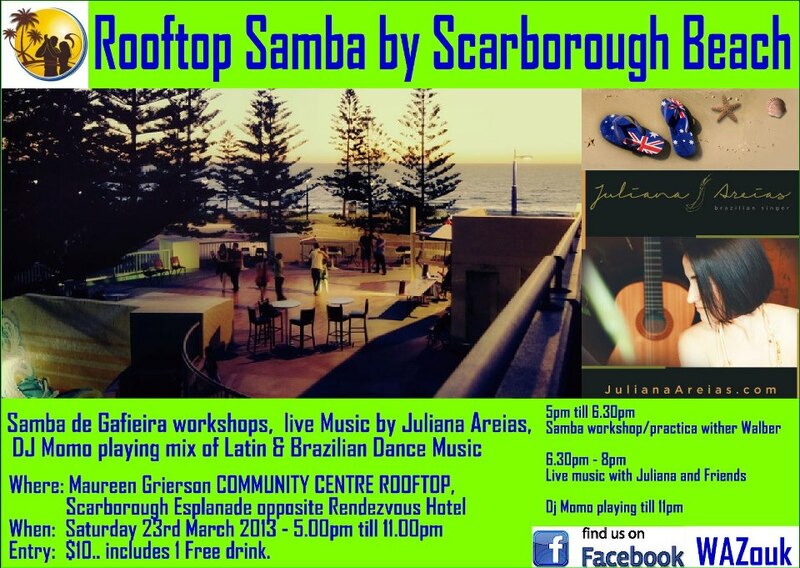 Juliana Areias & friends (6.30pm) + DJ Jelena (tango,samba,forro, zouk, Kizomba) @ Maureen Grierson Community Recreation Centre Rooftop Scarborough Esplanade – Beach foreshore, opposite Rendezvous Hotel. ). $10 tickets on the door. See Samba Style WA for information about Samba de Gafieira free lessons, social practices and activities. 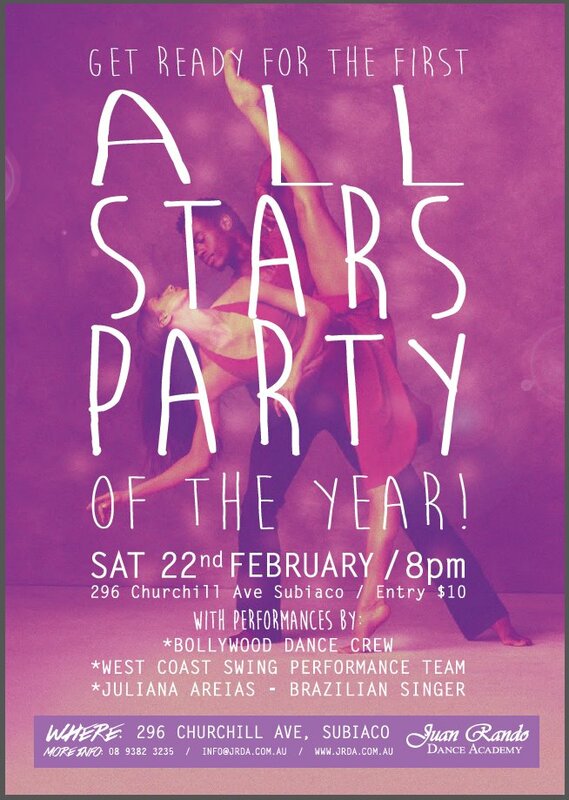 – Saturday 30 November from 8pm – JRDA All STARS – end of the year party – Featuring special guests Juliana Areias and Gus Potenza , dance performers Alisson Sandi and Audrey Isautier ( Juan Rando Dance Academy – 296 Churchill Ave Subiaco) – Zouk, Samba de Gafieira, Salsa, Bachatta, WestCoast Swing and more! – Saturday 30 November -1-3pm – every last Saturday of the month – Juliana Areias Duo at the Gypsy Tapas House ( Highgate Court, 124 High St – Cnr Queen St- Fremantle. Phone: 9336 7135) – 7-9 pm. Feat: Mark Shanahan-guitar. -Friday 29 November – Marcio Mendes and Friends at The Ellington Jazz Club, featuring special guests Juliana Areias, Tom Foss . Band : Marcio Mendes , Daniel Gonzalez ( Tijuana Cartel ) , Adam Springhetti, Dan Ablett and James Cross. – Sat 23 Nov – Juliana Areias Trio at X-Wray – Fremantle -6-8pm – Private Party. – Tuesday 2 Nov – Melbourne Cup – Special Guest at James Flynn Concert at the Royal Perth Golf Club. – Saturday 26 October -1-3pm – every last Saturday of the month – Juliana Areias Duo at the Gypsy Tapas House ( Highgate Court, 124 High St – Cnr Queen St- Fremantle. Phone: 9336 7135) – 7-9 pm. Feat: Mark Shanahan-guitar. 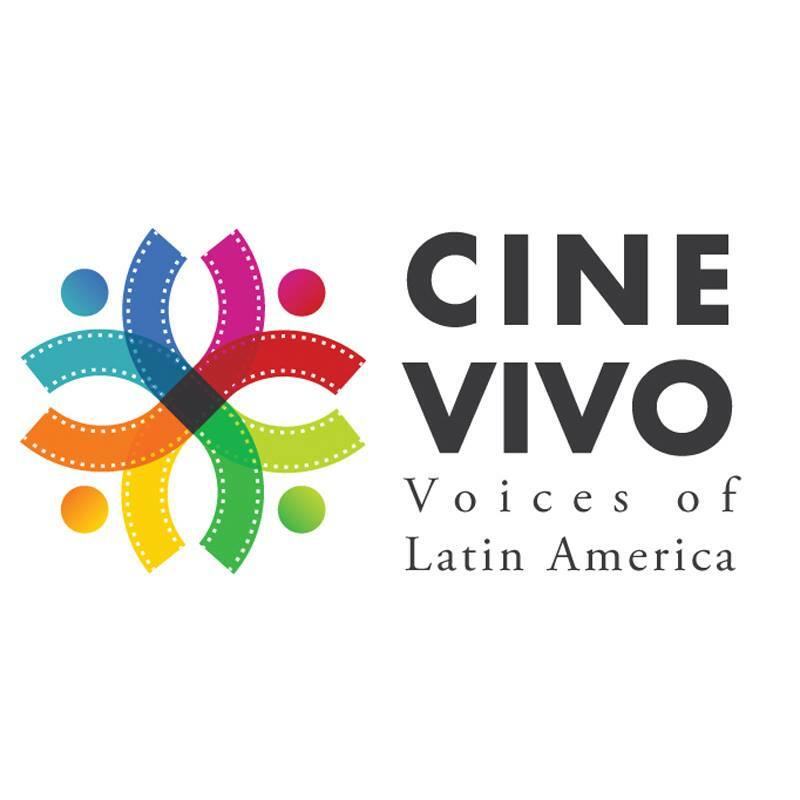 – Saturday 5 Oct – Latin American Film Festival – Closing Gala Night- feat. Marcio Mendes trio & special guest Juliana Areias. Door opens 5.30pm (traditional food), film 7pm. Live music and DJ Kizza after the film. (197 Scarborough Beach Road , Mount Hawthorn.). Event produced by Latin American Embassies and Oniria Language Studio. – Saturday 5 Oct -1-3pm – Juliana Areias Duo at the Gypsy Tapas House ( Highgate Court, 124 High St – Cnr Queen St- Fremantle. Phone: 9336 7135) – 7-9 pm. Feat: Mark Shanahan-guitar. – Saturday 28 September -1-3pm – every last Saturday of the month – Juliana Areias Duo at the Gypsy Tapas House ( Highgate Court, 124 High St – Cnr Queen St- Fremantle. Phone: 9336 7135) – 7-9 pm. Feat: Mark Shanahan-guitar. – Saturday 15 September – 66pm-12am – Ritmo Brazilian Day Festival After Party at The Hard Rock Cafe at Darling Harbour from 6pm til late feat: DJ Bobby Brazuka ( NZ ), DJ PG ( BR) and live music with Marcio Mendes & Juliana Areias (Perth) and Sandro Bueno. Address: HArbourside Centre Level 2/2 – 10 Darling Harbour, Sydney. – SAO PAULO – BRAZIL – Tuesday 10 September – 8-9pm – Samba Resolution – Short Video Documentary Launch at Cine Matilha Cultural – ( Rua Rego Freitas Sao Paulo). Documentary directed by Antony Webb and produced by Claudia Rondon. Featuring Perth Samba Social Club at the Inaugural Perth International Jazz Festival – Marcio Mendes, Tom Foss, Thiago Santos, Juliana Areias , Adam Springetti , Mike Boase, Nikki Dagostino and full Samba Big Band Orchestra. – Saturday 7 September – Brazilian Independence Day Party at The Ellington Jazz Club 11pm. Feat: Marcio Mendes and Samba Social Club. Special Guest – Juliana Areias. – Saturday 31 August -1-3pm – every last Saturday of the month – Juliana Areias Duo at the Gypsy Tapas House ( Highgate Court, 124 High St – Cnr Queen St- Fremantle. Phone: 9336 7135) – 7-9 pm. Feat: Mark Shanahan-guitar. – Saturday 27 July – 1-3pm – every last Saturday of the month – Juliana Areias Duo at the Gypsy Tapas House ( Highgate Court, 124 High St – Cnr Queen St- Fremantle. Phone: 9336 7135) – 7-9 pm. Feat: Mark Shanahan-guitar. Friday 19 July – ” Van Gogh, Dali & beyond: the World Reimagined”. The heart of New York’s Culture is now in Perth. 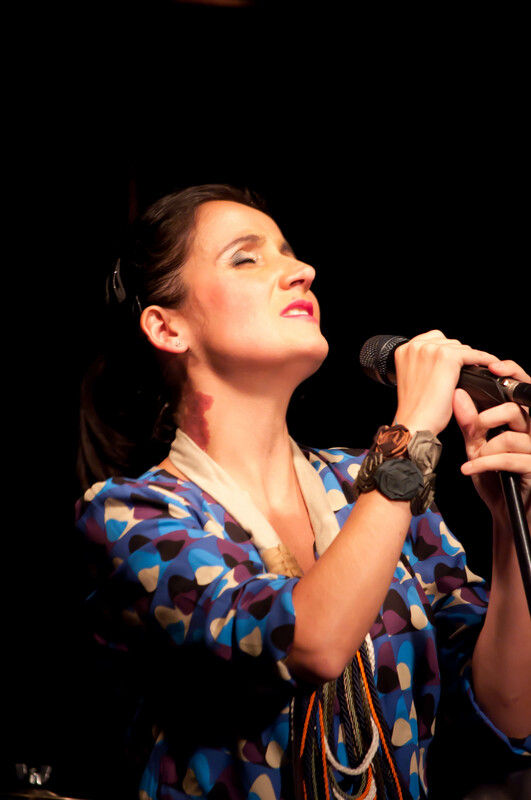 presents Juliana Areias Quartet at AGWA The Art Gallery of Western Australia -7-8pm – Book now . This visually stunning exhibition presents 134 masterworks by 96 of the world’s greatest artists. Reimagining the world around them, these artists invented new strategies that shaped modern art. This exhibition presents three of the most fundamental artistic genres which link and transcend the ‘isms’ of twentieth century art, from Impressionism, Cubism, Surrealism and beyond to the art of today. Saturday 13 July – Juliana Areias – METROPOLIS SHOW at The Ellington Jazz Club – 7pm – A Concert tribute to Sao Paulo City. Sunday 30 June – James Flynn concert at the Royal Golf Club – 3-6pm – Special guest appearance. Friday 28 June – Perth Samba Social Club – Marcio Mendes and friends at The Ellington Jazz Club – 10.30pm. Special Guest Juliana Areias. 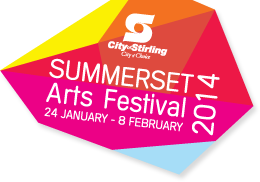 Friday 28 June – City of Perth – Winter Arts Season 2013 – Winter Supper Club at the under-croft and foyer of Perth Town Hall – 4.30-8.30pm – Free event. Juliana Areias Duo. 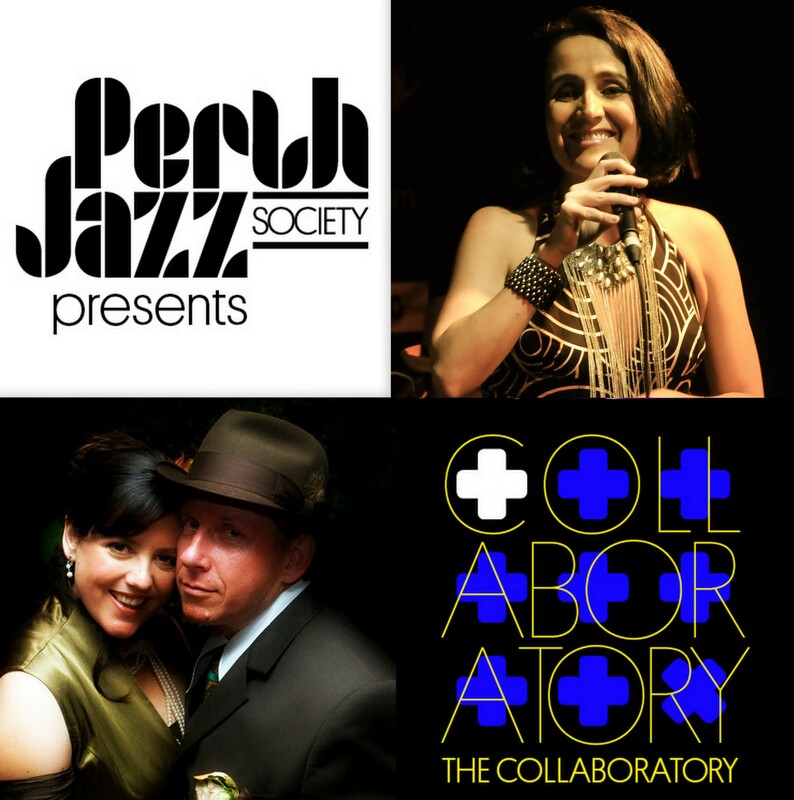 – Saturday 25 May – 1st Perth International Jazz Festival – 3-4pm at the Weld Square ( Cnr Newcastle and Beaufort Street, Perth ) – Juliana Areias Quintet – Honored to filling in for Victoria Newton – Water Colours of Brazil Show, sharing the stage with Tal Cohen, Mark Shanahan, Paul Pooley and Chris Tarr. – Saturday 20 April – 1pm – Special Jam @ the Gypsy Tapas House featuring YOU with Charmaine Jones & Mike Bevan touring from Adelaide + Brazilian singer Juliana Areias – Free Jazz, Brazilian, Blues, Gospel, Gypsy and everything in between for all music lovers, musicians, dancers and friends at the legendary Gypsy Tapas House in Fremantle – A feast for the senses – Great exotic food, music , place and atmosphere. ( 124 High St – Corner with Queen St – Fremantle. Ph: 9336 7135 ) . Special thanks to Una Healy & Stefan Armentano pioneer Gypsy patrons and great supporters of the Live Music Culture Scene of WA. – Saturday 6 April – Juliana Areias Band @ Pickett Park – Bullsbrook – 5 Maroubra Ave Bullsbrook – 6-7pm – Free music in the park show. 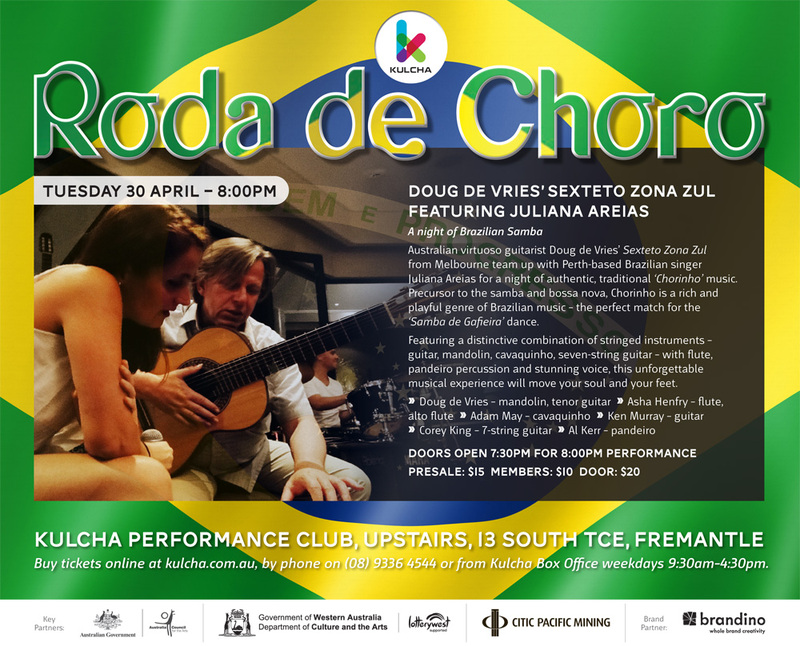 – RTR FM 92.1 – Global Rhythm Pot – 45 min live performance and interwiew 12.15-1pm – talking about The Roda de Choro show at Kulcha and Samba d Gafieira – the dance Australia is falling in love with. 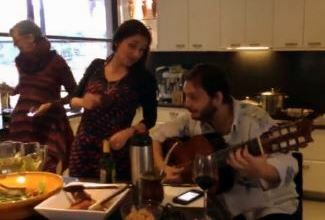 Playing and singing relevant choro and samba style songs. ( Brasileirinho, Noites Cariocas, Lamento , Passos de carangueijo, Mas que nada). 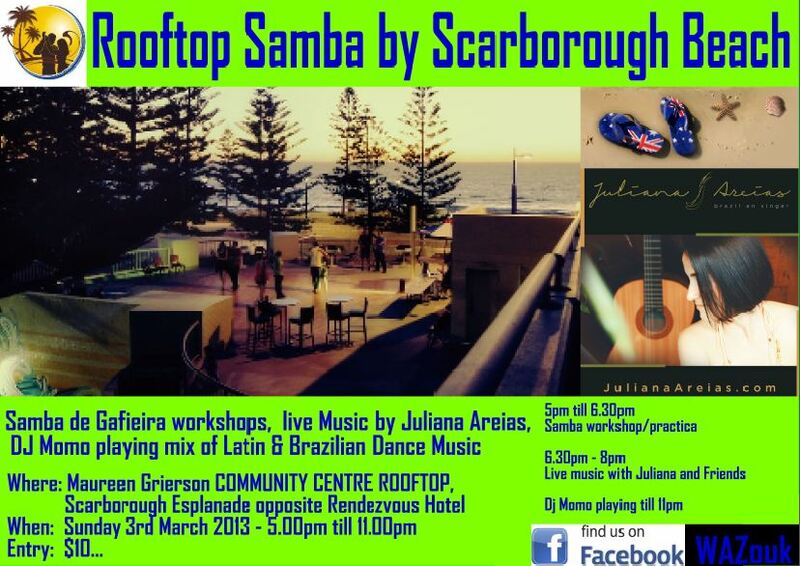 – Sat 23 March – Rooftop Samba @ The Esplanade – Scarborough Beach . Samba de gafiera workshop (5pm) +Live Music feat. Juliana Areias & friends (6.30pm) + DJ Momo (zouk, salsa and more) @ Maureen Grierson Community Recreation Centre Rooftop Scarborough Esplanade – Beach foreshore, opposite Rendezvous Hotel. ). $10 tickets on the door. See Samba Style WA for information about Samba de Gafieira free lessons, social practices and activities. – Sat 16 March – City Of Stirling Harmony Day @ Stirling Civic Gardens (Cedric St Stirling) Show featuring Juliana Areias Quartet – 5- 6 pm, plus Daramad and more. 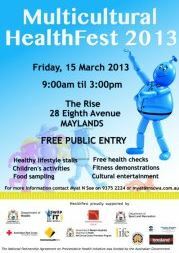 – Fri 15 March – Juliana Areias duo at the Multicultural HealthFest 2013 at The Rise – City of Bayswater. 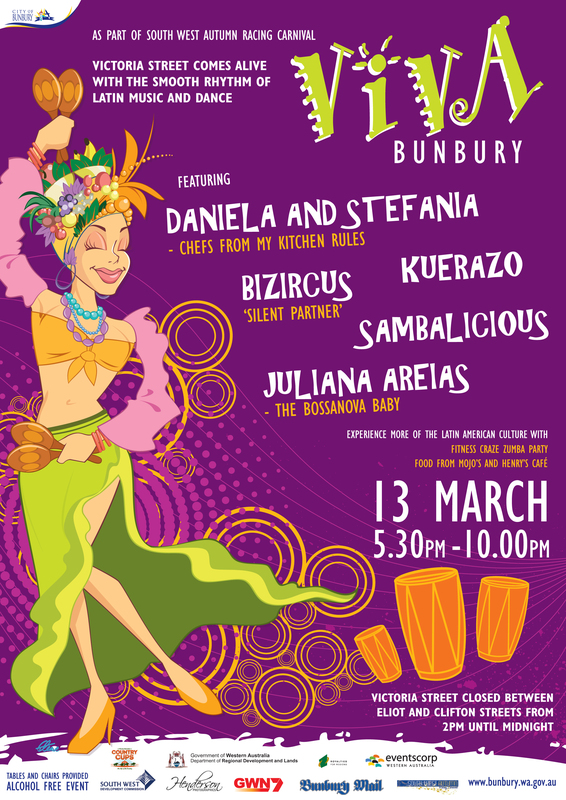 – Sunday 3 March – Rooftop Samba @ The Esplanade – Scarborough Beach . Samba de gafiera workshop (5pm) +Live Music feat. Juliana Areias & friends (6.30pm) + DJ Momo (zouk, salsa and more) @ Maureen Grierson Community Recreation Centre Rooftop Scarborough Esplanade – Beach foreshore, opposite Rendezvous Hotel. ). $10 tickets on the door. See Samba Style WA for information about Samba de Gafieira free lessons, social practices and activities. – Every Thursday (6.30 – 8 pm) – Hot Summer Nights @ The Kiosk – Floreat Beach ( Challenger Parade ) – A sensuous selection of Bossa, Samba, Beatles , French, Pop Jazz tunes performed with Brazilian passion and accent. 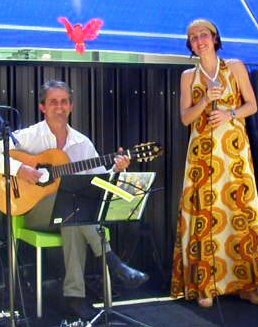 – Every Saturday (1-3pm) – Juliana Areias Duo @ Gypsy Tapas House ( Highgate Court, 124 High St – Cnr Queen St- Fremantle. Phone: 9336 7135) – 7-9 pm. Feat: Mark Shanahan-guitar. 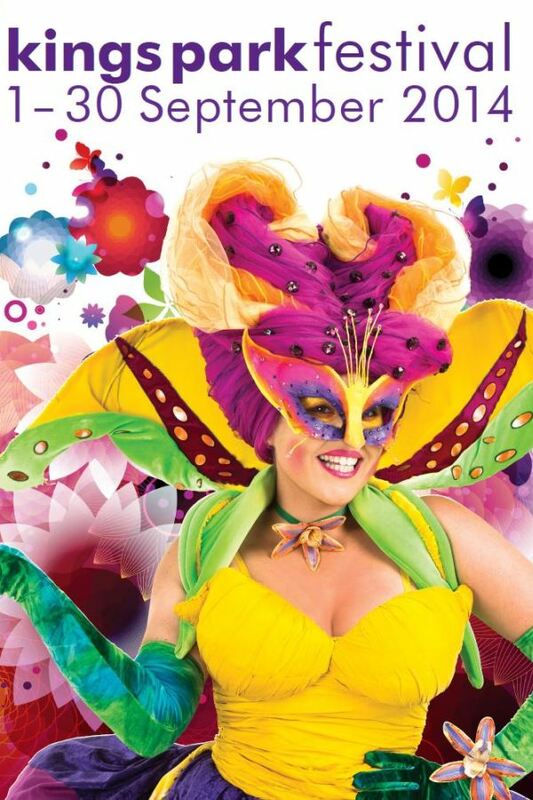 Sun 17 February – Brazilian Carnaval 2013 – Special Guest Appearance . Two samba and axe live bands, dance and capoeira shows and DJ. 4-10pm at The Deen Hotel. Event produced by Marcio Mendes. – Every Thursday 6.30 – 8 pm – Hot Summer Nights @ The Kiosk – Floreat Beach ( Challenger Parade ) – A sensuous selection of Bossa, Samba, Beatles , French, Pop Jazz tunes performed with Brazilian passion and accent. – Sat 26 January – Rooftop Samba – Australian Day @ The Esplanade – Scarborough Beach . Samba de gafiera workshop (5pm) +Live Music feat. Juliana Areias & friends (6.30pm) + DJ Momo (zouk, salsa and more) @ Maureen Grierson Community Recreation Centre Rooftop Scarborough Esplanade – Beach foreshore, opposite Rendezvous Hotel. ). $10 tickets on the door. See Samba Style WA for information about Samba de Gafieira free lessons, social practices and activities. 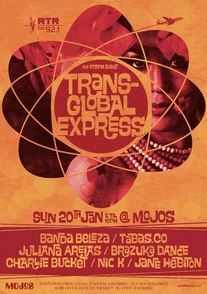 – Sunday 20 January – Transglobal Express – Travel around the world in a single night, with RTRFM’s Transglobal Express – a night of global grooves with a local focus, at Mojos on Sunday January 20 from 6pm til 10pm. 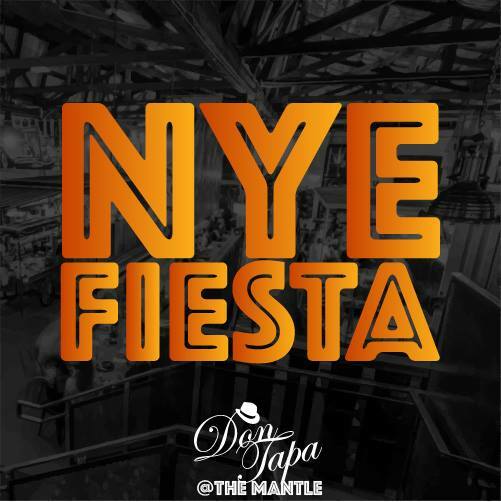 Performing to you on the night will be Banda Beleza, Tabas.Co, Kurbist Gong Band, and Juliana Areias – dance performances from from Beleza Samba and Brazuka Dance, plus your global rhythm DJs Charlie Bucket, Nic K and Jane Hebiton. Presale tickets are now available for rtrfm.com.au – they’re only $10 for subscribers and $15 for the general public. They’ll be more on the door on the night though, so grab yours now! – NEW YEAR’S EVE in ADELAIDE – Mon 31 December 2012 – Brazilian Reveillon House Concert – Exclusive jam session featuring for the first time all together Brazilian singer Juliana Areias, Brazilian Multi instrumentalist Heloisa McMillan, guitarist Mike Bevan , Australian virtuoso guitarist Doug DeVries, flutist Andy Bevan; singers Luciana Negrao, Diana Clark and Charmaine Jones; Alan Lawson, Glenn McMillan and international touring musicians from The Cirque du Soleil – Ovo – Robson Cerqueira, Daniel Baeder, and Sébastien Savard . Organization: Andrea Hughes. Invited guests only. Special Thank to Negrao and McMillan Family. Juliana Areias’ trip sponsored by Oi Exchange. See more photos here. – SATURDAY 22 December – 6-8pm – Juliana Areias – The Bossa WAY – End of the Year Show @ The Ellington Jazz Club. – BOOK NOW Featuring finest Australian Guitarist Mark Shanahan and Brazilian Multi instrumentalist Leandro Cezarino ( guitar, cavaquinho and percussion). 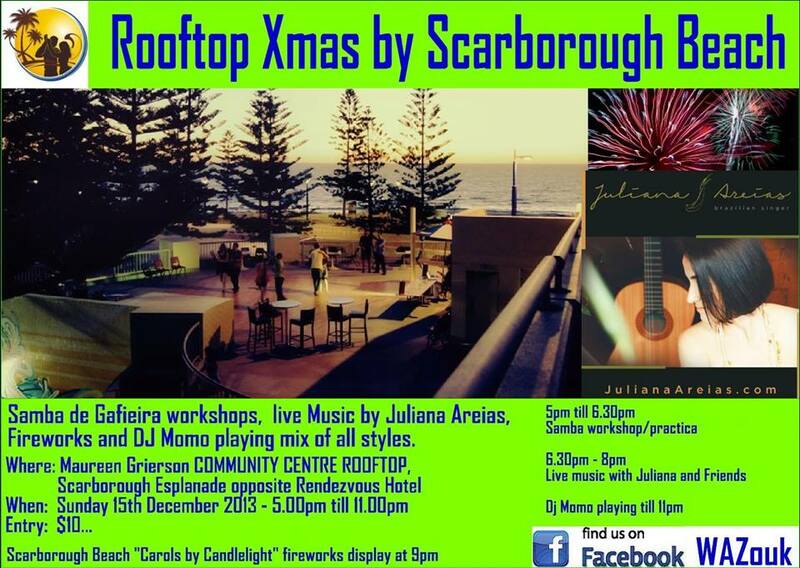 – Sunday 16 December – Rooftop Xmas Dancing Party at The Esplanade – Scarborough Beach . Samba de gafiera workshop (5pm) +Live Music feat. Juliana Areias & friends (6.30pm) + fireworks + DJ Momo @ Maureen Grierson Community Recreation Centre Rooftop Scarborough Esplanade – Beach foreshore, opposite Rendezvous Hotel. ). $10 tickets on the door. See Samba Style WA for information about Samba de Gafieira free lessons, social practices and activities. – Saturdays 1, 8, 22 December (1-3pm) – Juliana Areias Duo @ Gypsy Tapas House ( Highgate Court, 124 High St – Cnr Queen St- Fremantle. Phone: 9336 7135) – 7-9 pm. Feat: Mark Shanahan-guitar. – Sunday 25 Nov – MOSMAN PARK – JAZZ PICNIC CONCERT – 4-7pm – at the Memorial Park – Juliana Areias – Brazilian Jazz Quintet (6-7pm). Earlier acts: Metro Big Band, Perth Swing Dance Society. 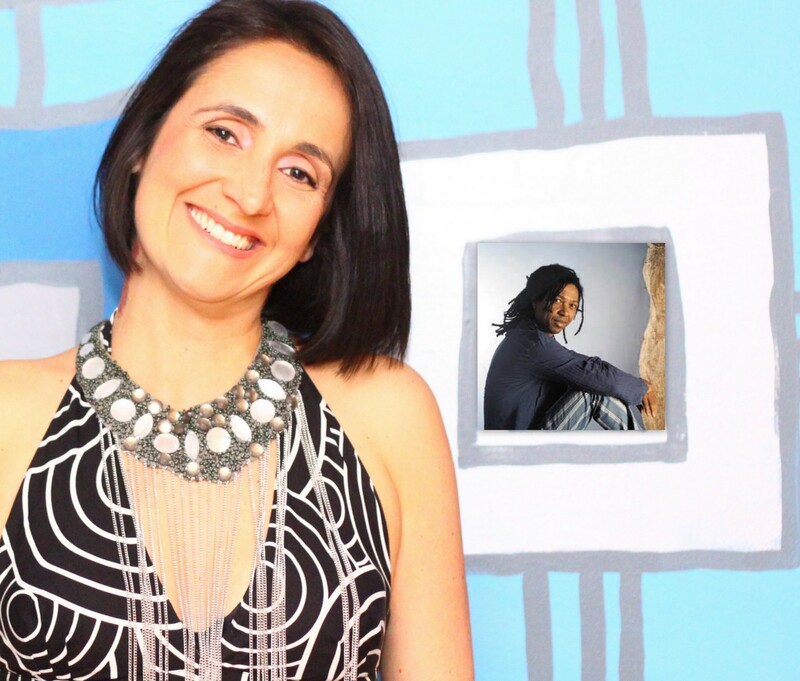 – Sat 17/11 – Juliana Areias Trio @ Joondalup Resort – Private Function. – – Wed 7 Nov – FREMANTLE FESTIVAL – JAZZDEZVOUS IN THE FLY TRAP! 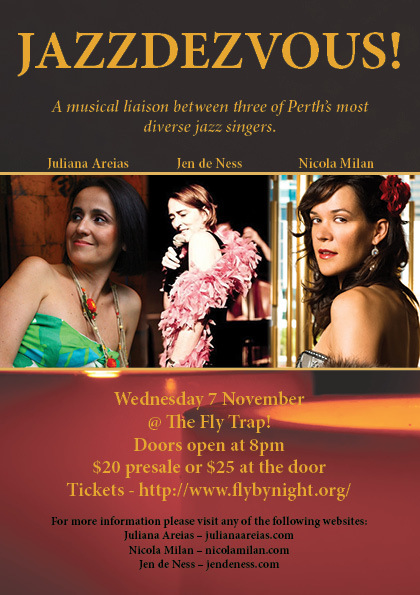 (back of Fly by Night)- Juliana Areias, Nicola Milan and Jen de Ness – a musical liaison between three of Perth’s most diverse jazz singers. Doors Open: 8.00pm. – Tue 6 Nov – Special guest appearance – James Flynn Trio at The Royal Perth Golf Club – Melbourne Cup Event. – 1-4pm. – Every Thursday 6.30 – 8 pm – Hot Summer Nights @ The Kiosk – Floreat Beach ( Challenger Parade ) – A sensuous selection of Bossa, Samba, Beatles , French, Pop Jazz tunes performed with Brazilian passion and accent. Feat. – Saturdays 3, 10, 24 November (1-3pm) – Juliana Areias Duo @ Gypsy Tapas House ( Highgate Court, 124 High St – Cnr Queen St- Fremantle. Phone: 9336 7135) – 7-9 pm. Feat: Mark Shanahan-guitar. 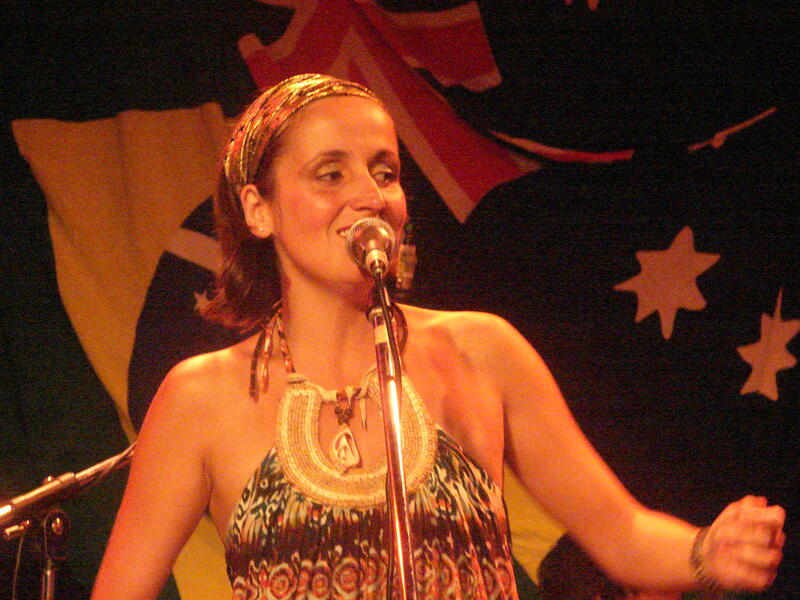 – Sunday 28 October – Juliana Areias Duo @ The Wild Fig – Scarborough (190 The Esplanade – (08) 9245 5222). – Sunday 14 October – Opening Ceremony of 2oth Perth’s Amateur Soccer World Cup – Brazil X Australia Match – 12pm/ Live Performance – 3pm at Floreat Athena Stadium (41 Brittannia Rd – Mt Hawthorn). 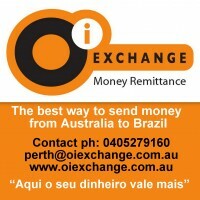 Brazilian Team Sponsored by Brazil WA, Pele, Oi Exchange and Information Planet. – Thursday 11 Oct (7-9pm) +Saturdays 13, 27 October (1-3pm) – Juliana Areias Duo @ Gypsy Tapas House ( Highgate Court, 124 High St – Cnr Queen St- Fremantle. Phone: 9336 7135) – 7-9 pm. Feat: Mark Shanahan-guitar. – SYDNEY TOUR – Fri 14 to Wed 19 September . Including Ritmo Festival @ Tumbalong Park -Darling Harbour on Sunday 16 Sept 3.30 pm. Featuring Juliana Areias, Marcio Mendes, Leandro Cezarino, Eddie Brasil. Festival Program . SBS Radio interview 15/9 and live performance at Vibez Brazil – 89.7 Eastside FM – 18/9 with Raphael Brasil, Marcio Mendes, Leandro Cezarino, Gabriela Soares and Oscar Jimenez. 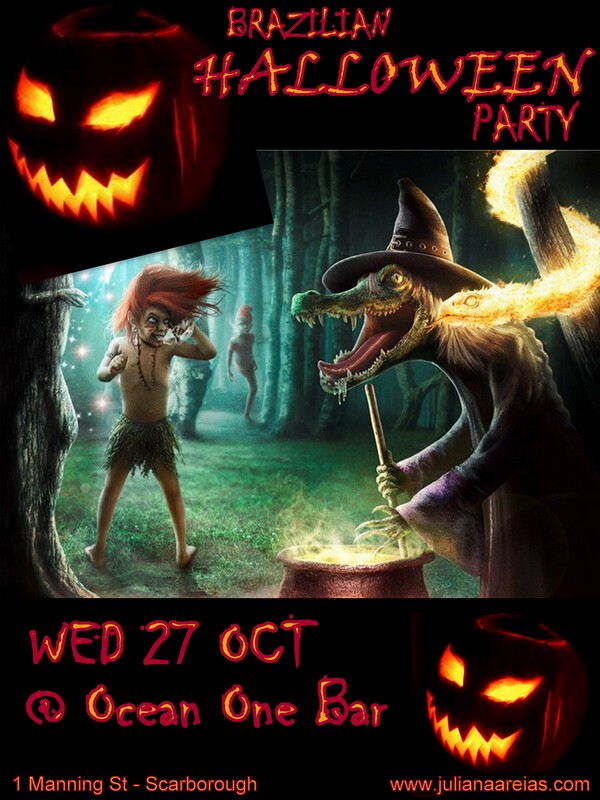 – Thursday 13 Sept – Brazilian Night at Black Betty’s – Special guest. Feat. Rock Brazil Night. – Sat 1, 8 Sept (1-3pm) + Thursday 13 Sept (7-9pm) – Juliana Areias Duo @ Gypsy Tapas House ( Highgate Court, 124 High St – Cnr Queen St- Fremantle. Phone: 9336 7135) – 7-9 pm. Feat: Mark Shanahan-guitar. – Thursday 9 Aug (7-9pm) +Saturdays 4, 11 August (1-3pm) – Juliana Areias Duo @ Gypsy Tapas House ( Highgate Court, 124 High St – Cnr Queen St- Fremantle. Phone: 9336 7135) – 7-9 pm. Feat: Mark Shanahan-guitar. -Sunday 22 July – The Brazilian Folk Festival – Brazil WA Festa Junina 2012 – At City Farm – East Perth – Live show with Marcio Mendes Forro Band featuring Juliana Areias 4.30pm – 7pm. Event starts 12pm – 7 hours of typical Brazilian Folk dishes, drinks, costumes, colors, dance, music, games for kids and adults. – Thursday 12 July (7-9pm) + Saturdays 7, 14 July (1-3pm) – Juliana Areias Duo @ Gypsy Tapas House ( Highgate Court, 124 High St – Cnr Queen St- Fremantle. Phone: 9336 7135) – 7-9pm. Feat: Mark Shanahan-guitar. – Thursday 14 June (7-9pm) + Saturdays 2, 16 June (1-3pm) – Juliana Areias Duo @ Gypsy Tapas House ( Highgate Court, 124 High St – Cnr Queen St- Fremantle. Phone: 9336 7135). Feat: Mark Shanahan-guitar. – ALBANY TOUR – Sat /Sun 19, 20 May– Duo performances with guitarist Mark Shanahan. – Friday 11 May – Juliana Areias and Marcio Mendes – A tribute to Noel Rosa at the 7th Latin American Film Festival Opening Night – Oniria Language Studio, 201 Roberts Street (Cnr of Banksia St), JOONDANNA. 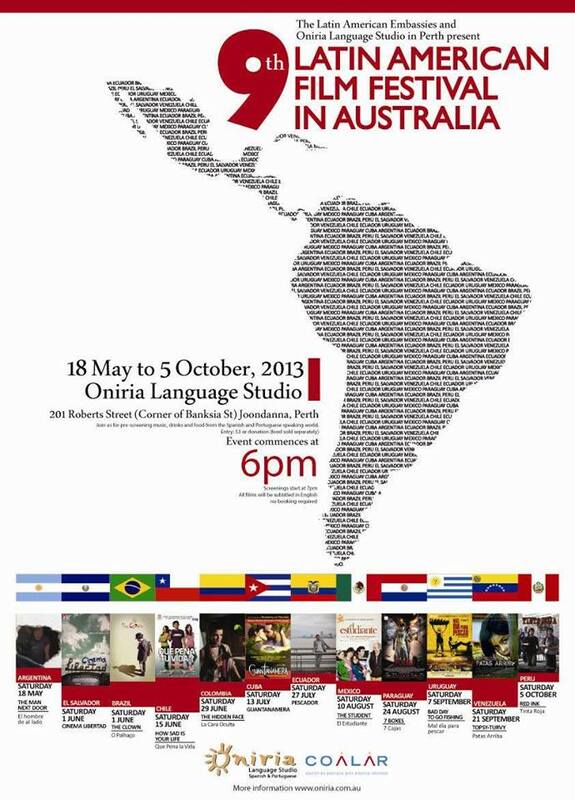 FREE event supported by the Latin American Embassies in Australia and Oniria Language Studio. 10 films from Cuba, Venezuela, Peru, Colombia, Brazil, Argentina, Uruguay, Mexico, Ecuador and Chile. – Thursday 10 May (7-9pm) + Saturdays 5, 12 May (1-3pm) – Juliana Areias Duo @ Gypsy Tapas House ( Highgate Court, 124 High St – Cnr Queen St- Fremantle. Phone: 9336 7135) . Feat: Mark Shanahan-guitar. 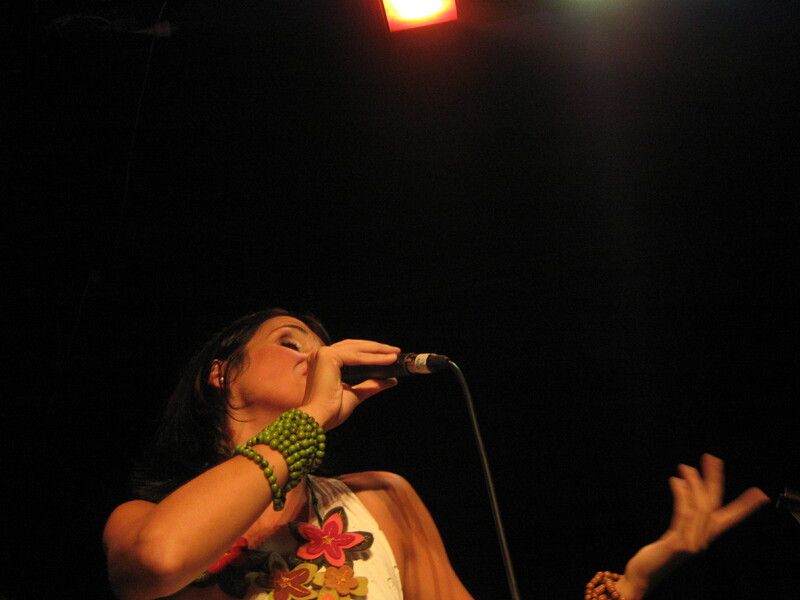 – Saturdays 7, 14 April – Juliana Areias Duo @ Gypsy Tapas House ( Highgate Court, 124 High St – Cnr Queen St- Fremantle. Phone: 9336 7135) – 1-3pm. Feat: Mark Shanahan-guitar. – Friday 6 April – Latin and Brazilian Classics Feat. Juliana Areias and Glenn Rogers @ The Pickled Fig ( 21 Ocean Dr, South Fremantle). * Event hosted by Victonia Newton. – Thursday 5 April 6.30 – 8 pm – Last Sunset Songs of this Summer season @ The Kiosk – Floreat Beach ( Challenger Parade ) – A sensuous selection of Bossa, Samba, Beatles and French Jazz tunes performed with Brazilian passion and accent. Feat. Juliana Areias – vocals and Mark Shanaham – Guitar. 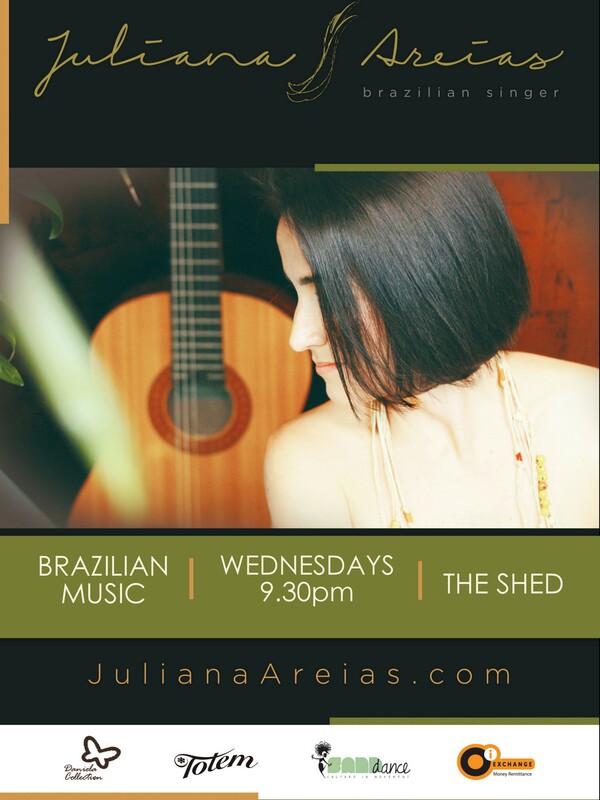 Wednesday 4 April– Juliana Areias New Band LIVE @ The Shed (69-71 Aberdeen St Northbridge ph 92282200) 9pm-11.30pm – Sensuous and Groovy Traditional and Contemporary Brazilian Music – the colours, the sounds and the moves of Brazil in the heart of the city. Event presented by Damiano Ciranna Entertainment. 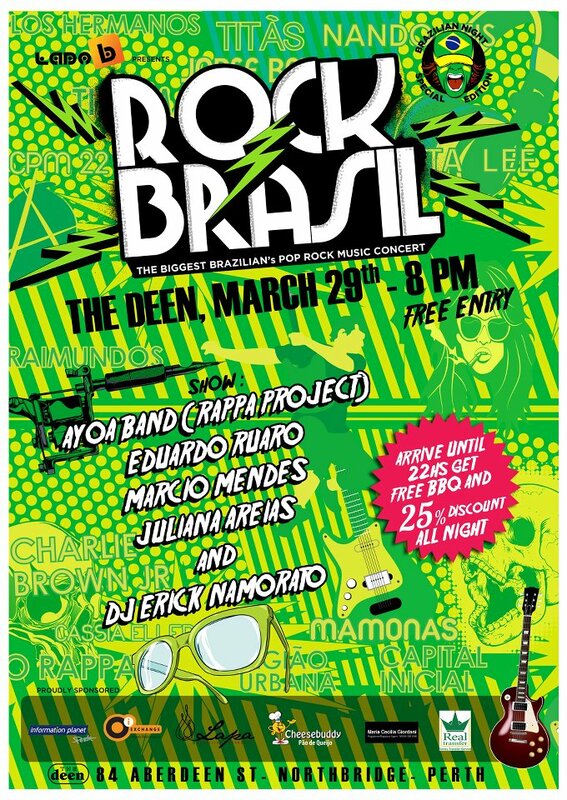 – Thursday 29 March – Rock Brazil Night @ The Deen – 10pm featuring AYOA Band (Rappa Project) , Eduardo Ruaro, Marcio Mendes, Juliana Areias and DJ Erik Namorato. Event produced by Lado B Productions. – Tuesday 20 March – EXTRA CONCERT: Juliana Areias – 7 pieces band – Born to samba – The Carnival Zest Show @ Ellington Jazz Club (191 Beaufort St). SOLD OUT Feat. Feat: Marcio Mendes (guitar , cavaquinho, backing vocal , musical direction/ arrangement) ; Adam Springuetti ( double bass, guitar, musical direction/arrangement); Jeremy Greig (Tombone); Chris Tarr ( drums); Tom Foss ( percussion); Gabriel Porto ( percussion) and Special guest Mark Shanaham ( guitar) . Production: Juliana Areias. Sponsors: Oi Exchange , Totem, Daniela Collection and Sand Dance (Zumba and Samba training and shows) – 0424299140 . 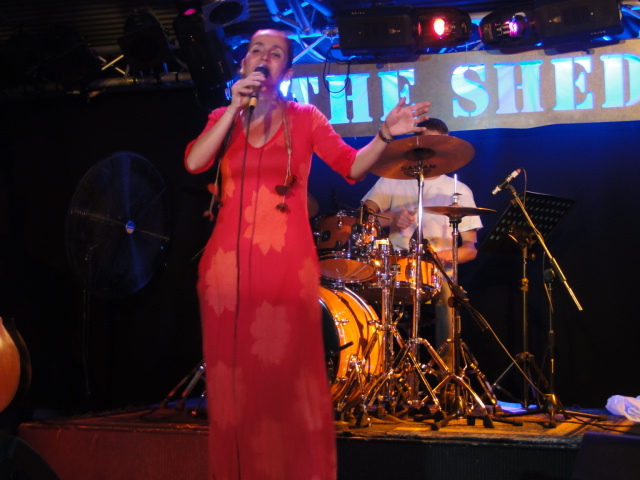 Every Wednesday – Juliana Areias Quartet LIVE @ The Shed (69-71 Aberdeen St Northbridge ph 92282200) 9pm-11.30pm – Featuring pianist Tal Cohen, Bassist Adam Springuetti and Drummer Bronton Ainsworth. The“House of Latin Rhythms” is a project presented by Damiano Ciranna Entertainment, including Salsa, Souk and Samba de Gafieira Dance Classes. – Every Thursday 6 – 7.30 pm – Sunset Songs @ The Kiosk – Floreat Beach ( Challenger Parade ) – A sensuous selection of Bossa, Samba, Beatles and French Jazz tunes performed with Brazilian passion and accent. Feat. Juliana Areias – vocals and Mark Shanaham – Guitar. 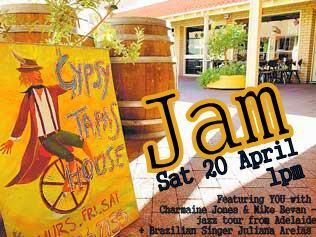 – Saturdays 3, 10 March – Juliana Areias Duo @ Gypsy Tapas House ( Highgate Court, 124 High St – Cnr Queen St- Fremantle. Phone: 9336 7135) – 1-3pm. Feat: Mark Shanahan-guitar. 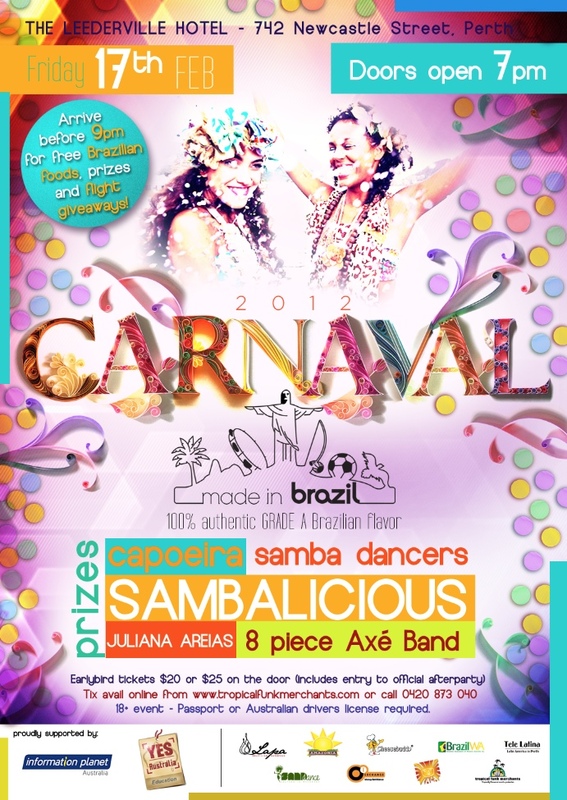 – Fri 17 Feb – CARNAVAL 2012 – Made in Brazil @ Leederview Hotel – from 7pm – Sambalicious (8 pieces band) officially featuring Juliana Areias as a special guest for the first time + Capoeira + Samba and Axe Dancers (Sand Dance Group sponsored by Oi Exchange) + Brazilian Food + Prizes. Event also supported by BRAZIL WA – The Brazilian Association of Western Australia Inc.
– Saturdays 4, 11 February – Juliana Areias Duo @ Gypsy Tapas House ( Highgate Court, 124 High St – Cnr Queen St- Fremantle. Phone: 9336 7135) – 1-3pm. Feat: Mark Shanahan-guitar. 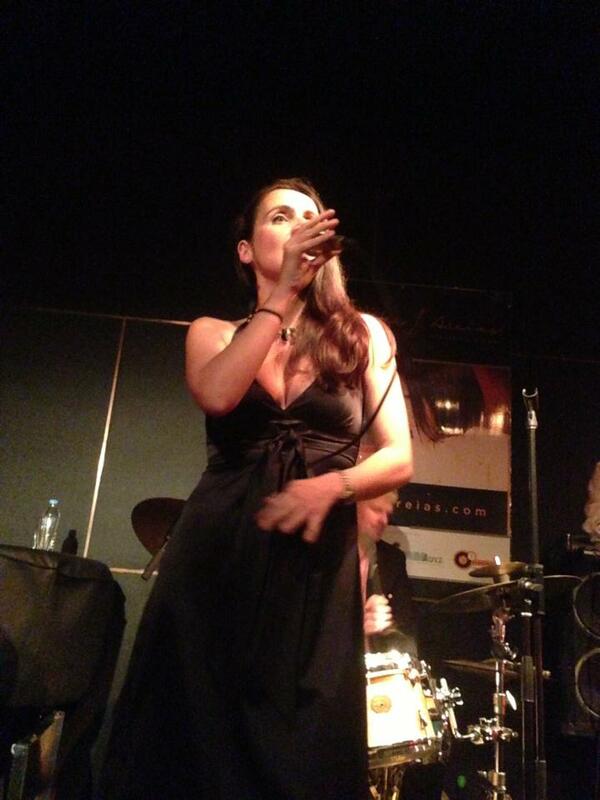 – Saturdays 14, 21 January Juliana Areias Duo @ Gypsy Tapas House ( Highgate Court, 124 High St – Cnr Queen St- Fremantle. Phone: 9336 7135) – 1-3pm. Feat: Mark Shanahan-guitar. 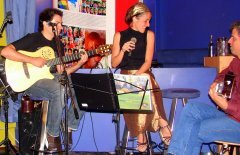 – Saturdays 3, 10 December – Juliana Areias Duo @ Gypsy Tapas House ( Highgate Court, 124 High St – Cnr Queen St- Fremantle. Phone: 9336 7135) – 1-3pm. Feat: Mark Shanahan-guitar. – Saturdays 12, 19, 26 November – Juliana Areias Duo @ Gypsy Tapas House ( Highgate Court, 124 High St – Cnr Queen St- Fremantle. Phone: 9336 7135) – 1-3pm. Feat: Mark Shanahan – guitar. 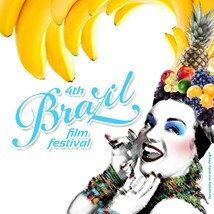 – Thurs 17-20 Nov – Juliana Areias Duo at The Brazil Film Festival Opening 17th – 6pm @ Paradizo Cinemas – Northbridge / Closing 20th -8pm @ Sussa Brazil Lounge – (beside Paradizo Cinema – Oliver’s – 160James St – Northbridge). Feat. Mark Shanaham – guitar. – Sat 5 Nov – BrazilFEST – capoeira, music, dance, food and films @ Piazza – Northbridge – All day open event. (10am-10pm). Event created by Bantus Capoeira. Gafiera by Alisson R. Sandi (Juan Rando Dance Academy Allison). Supported by City of Perth, Sussa Events and Brazil WA – Brazilian Association of Western Australian Inc. and Brazil Film Festival. – Saturday 22 Oct – Juliana Areias quartet – Feijuca at Floreat Beach – featuring Juliana Areias (vocals), Eduardo Ruaro ( guitar and vocals), Giba Carvalho (bass) and Mike Boase (drums and percussion). Full day event with Brazil WA Beach Volley Ball Competition + Brazilian live music, Dj Pinguim and traditional Brazilian national dish “feijoada. Event produced by Sussa events. Sponsored by Oi exchange and Sussa bar. Supported by Brazil WA and Cheesebuddy. – Saturdays 8, 15 October – Juliana Areias Duo @ Gypsy Tapas House ( Highgate Court, 124 High St – Cnr Queen St- Fremantle. Phone: 9336 7135) – 1-3pm. Feat: Juliana Areias and Mark Shanahan. 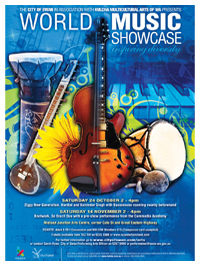 Special guest presentation – Sunday 25 September –Kings Park Festival – Everlasting Jazz Picnic – Watercolors of Brazil – Victoria Newton Concert- 2-4pm. Featuring : Mark Shanahan-guitar, Nick Abbey-bass and Chris Tarr-drums. Special guest: ” the fabulous Brazilian singer Juliana Areias”. 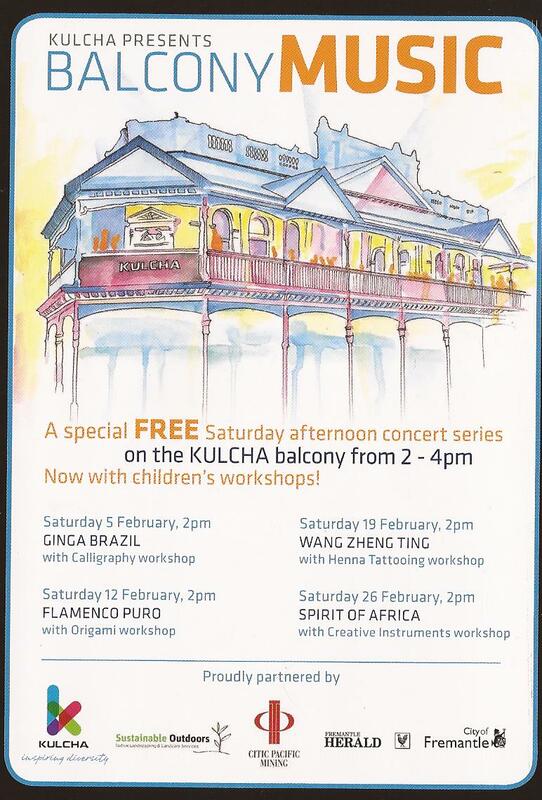 Event organised in partnership with the Perth Jazz Society, Santos and Kings Park. 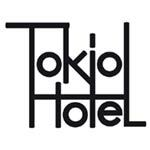 – Sat 17/9 – 7-8pm @ Tokio Hotel, ( Darling Harbour – Sydney – Cockle Bay Wharf ) – acoustic chill out session. Feat.Juliana Areias and Marcio Mendes. Free event. 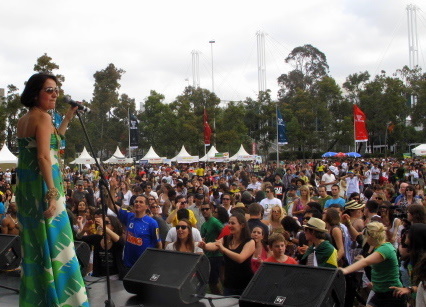 – Sunday 18 September – Ritmo Brazilian Festival (Darling Harbour , Sydney) – 3-4 pm – feat. Brazilian Singer Juliana Areias and Marcio Mendes & Thiago Santos (from Sambalicious). Tumbalong Park will come alive with the tastes and sounds of Brazil. The festival will feature cultural performances, art and craft stalls and traditional cuisine. Free Event from 11am-6pm) . Juliana is brought to the Festival by the sponsors Oi Exchange and ECU – Edith Cowan University Event organized by BRACCA. 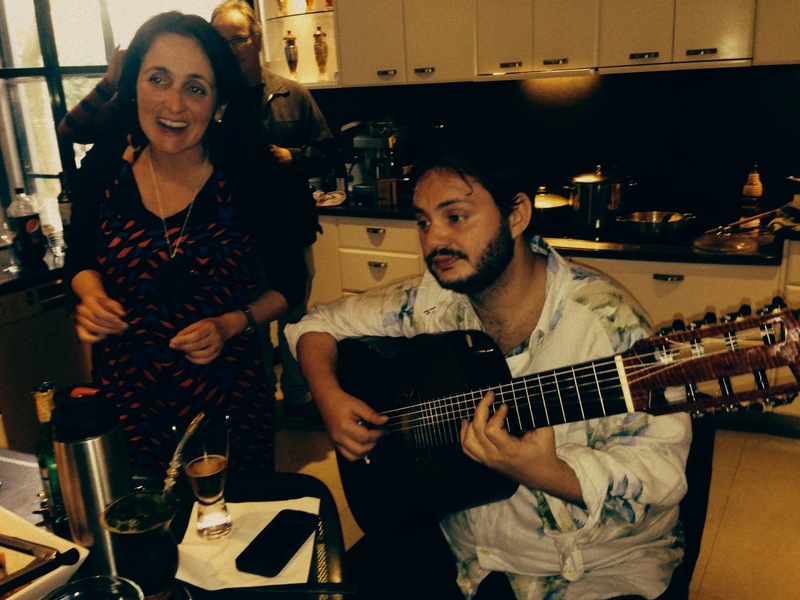 – Saturday 10 September – Juliana Areias Duo @ Gypsy Tapas House. Feat: Juliana Areias and Mark Shanahan. – Wed 17 Aug – 80’s Brazilian Pop Rock – “two steps from paradise” featuring Juliana Areias, Marcio Mendes and Giba Carvalho @ Ocean One Bar (1 Manning St Scarborough) – from 8pm to Midnight. 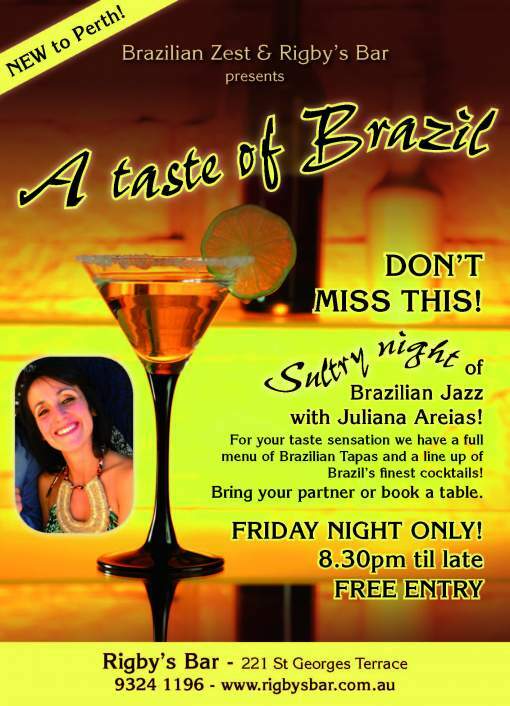 – Saturday 6 August – Juliana Areias Duo @ Gypsy Tapas House. Feat: Juliana Areias and Glenn Rogers. 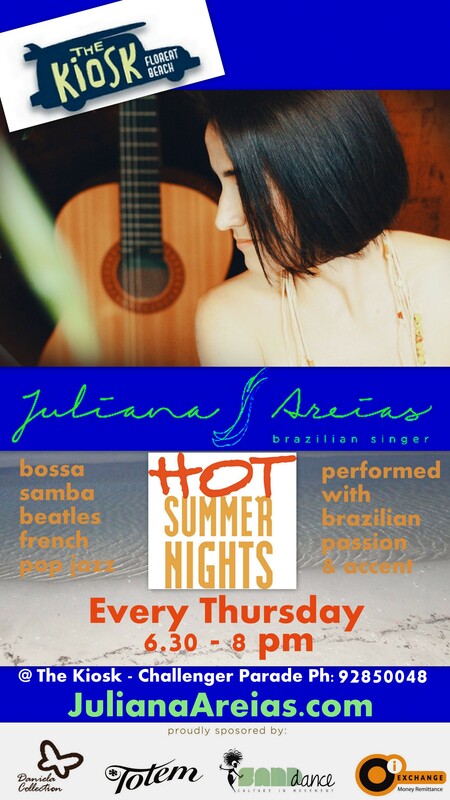 – Saturdays 23, 30 July– Juliana Areias Duo @ Gypsy Tapas House. Feat: Juliana Areias and Eduardo Mello. – Wed 20 July – Juliana Areias & Pablo Sganzerla @ Ocean One Bar – Scarborough. Feat: Giba Carvalho- bass and Marcio Mendes – Percussion. 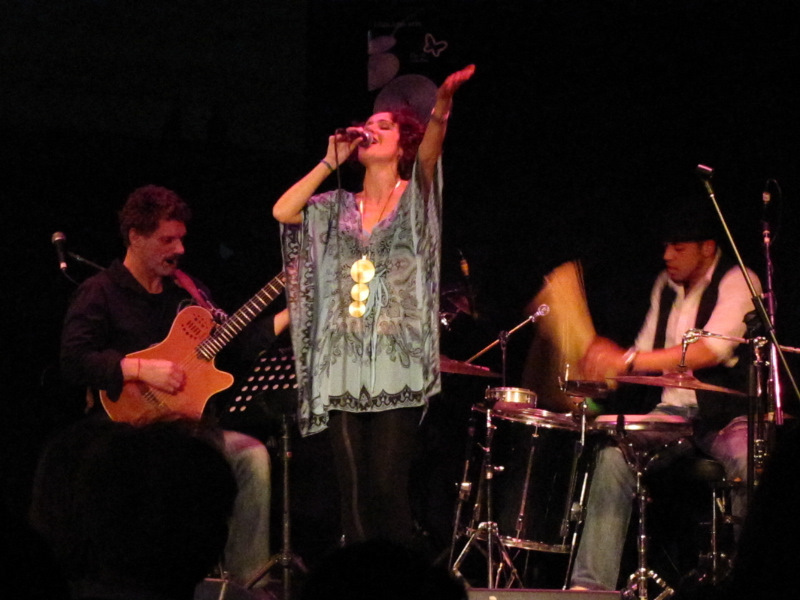 – Wed 20 July – Juliana Areias – Jazz Brazil Concert @ Don Russell Performing – Arts Centre (Morning Melodies Series) . Feat. Juliana Areias and pianist Tal Cohen. – Sat 16 July – Perth’s St John’s Party @ Doubleview Bowling and Recreational Club – Sold out in advance. Event produced by Sussa. Sponsored by Australian Centre, Global Village and West Australian Institute of Further Studies (WAIFS) and supported by Cheesebuddy, Mad Cake House and Brazil WA – Brazilian Association of Western Australia Inc.
– Fri 8 July – Juliana Areias – Yes Brazil Concert @ Kulcha – Multicultura Arts Centre of WA. Feat. : Brazilian multi-instrumentalists and singers Eduardo Mello and Marcio Mendes. Juliana Areias sponsors’: Oi Exchange, Daniela Collection , Totem , Carmen Steffans , Jacqueline Arenhardt (hair and make up style ). – “XO” – directed by Eva Ramdohr ( Dungog Film Festival, NSW 2011; Cergy-Pontoise – France 2011; Heart of Gold, QLD 2011). – WED 8 June -Juliana Areias – Ginga Brazil Concert @ The Ellington Jazz Club (191 Beaufort St, Perth Ph: 9228 1088 Information: www.ellingtonjazz.com.au – Feat: guitarist Glenn Rogers, bassist Matt Bell and drummer Michael Boase. Sound Engineer Liam Crosby. Production Juliana Areias. Photos: Felipe Azevedo. Video: Luciana Negrao. Juliana Areias sponsors’: Oi Exchange, Daniela Collection , Totem , Carmen Steffans , Jacqueline Arenhardt (hair style ) and Sandra Barbosa – (make up). 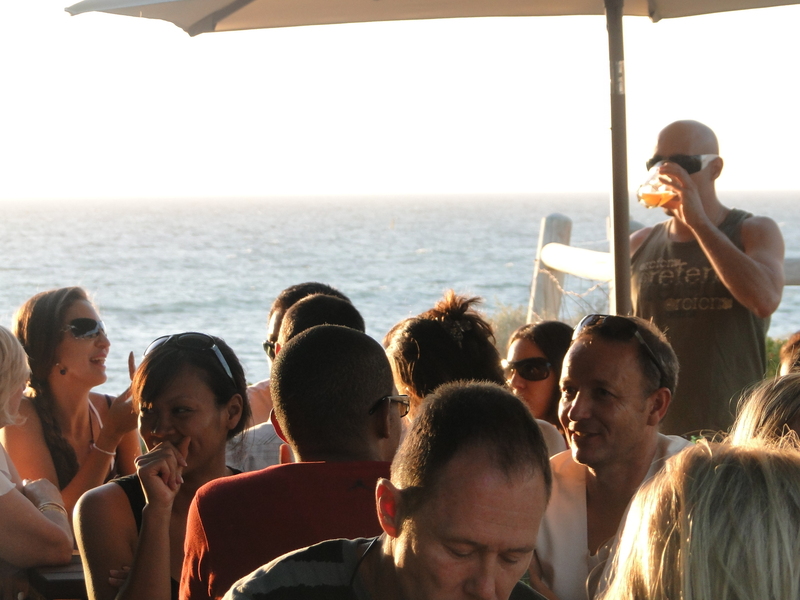 – Wednesdays 4, 11 May – Juliana Areias and friends @ Ocean One Bar. 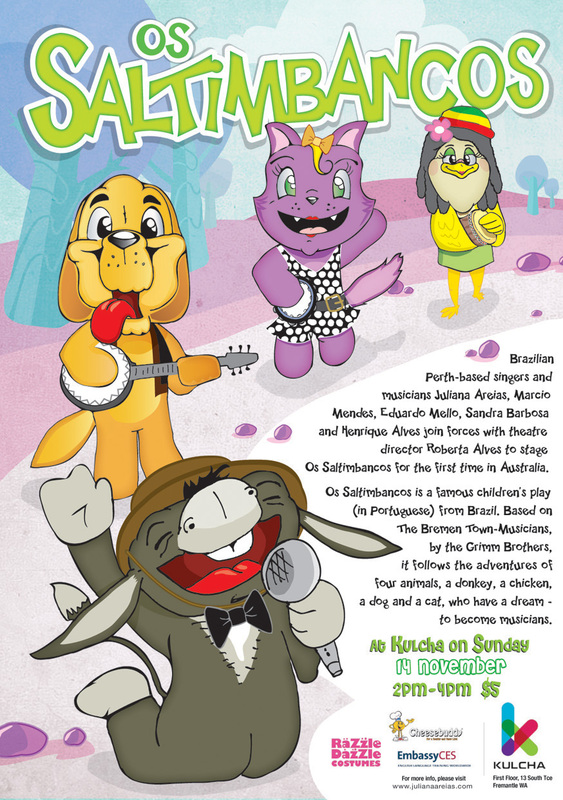 Feat: Juliana Areias, Eduardo Mello , Giba Carvalho and Tuta. – Saturdays 7, 14, 21 May – Juliana Areias Duo @ Gypsy Tapas House. Feat: Juliana Areias , Eduardo Mello and Mark Shanahan. – SINGAPORE TOUR – Fri 27 May – Fri 3 June – Special Guest presentations in Singapore – James Flynn Concert ( Sat 28 May -Jazzist Society) and Maya Nova Concert (Sat 28 May and Mon 30 May – Ink Club Bar – The Stamford Hotel). 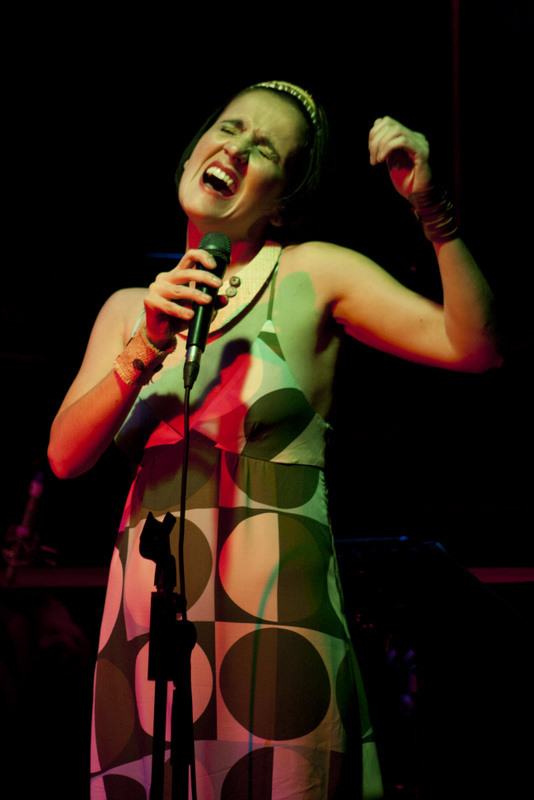 – WED 20 April – Juliana Areias – Ginga Brazil Concert Premier @ The Ellington Jazz Club (191 Beaufort St)- 8pm . SOLD OUT Feat: guitarist Glenn Rogers, bassist Pete Jeavons, drummer Michael Boase, pianist Tal Cohen and Brazilian percussionist Marcio Mendes. Sound Engineer: Liam Crosby. Production: Juliana Areias. Photos: Gilberto Carvalho, Felipe Azevedo, Renata Martins, Flavia Oats and Sandra Barbosa . Video: David Meadows. Juliana Areias sponsors’: Oi Exchange, Daniela Collection , Totem , Carmen Steffans , Jacqueline Arenhardt (hair style ) and Sandra Barbosa – (make up). Photos: Gilberto Carvalho, Timothy Grose. Video: Claudia Rondon/ David Meadows. Juliana Areias sponsors’ : Daniela Collection , Totem , Carmen Steffans , Jacqueline Arenhardt (hair style ) and Sandra Barbosa – (make up). Ginga Brazil Concert at the Kulcha’s Balcony – 5 Fev 2011 – featuring Juliana Areias, Glenn Rogers, Adam Springhetti and Marcio Mendes. Sponsors: Daniela Collection, Totem and Carmen Steffens. Event proudly partnered by: Kulcha, Sustainable Outdoors, City Pacific Mining, Fremantle Herald and City of Fremantle. 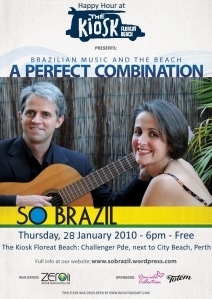 Brazilian Music and the Beach – Perfect Combination @ The Kiosk Floreat Beach – Every Thursday from 2 Dec 2010 – 31 March 2011. Sponsors: Daniela Collection and Totem. Ginga Brazil Concert at The Fremantle Festival – 14 November 2010. Sponsor: Daniela Collection. Saltimbancos – Kids Musical at Kulcha – Fremantle Festival – 14 November 2010. Produced by Zeroii Arts & Science. Brazilian Halloween Party – at Ocean One Bar. Photos: Brazilian Halloween Party on Wed 27 Oct 2010. – Brazilian Tambourine – The Brazilian Independence Month Wrap Up Party – 19 September 2010 @ Rigby’s Bar. Event produced by BZest and Marcio Mendes. – Brazilian Independence Day Cerimony – 7 September 2010 – at Scarborough Amphitheatre – Scarborough Beach. Produced by BZest. 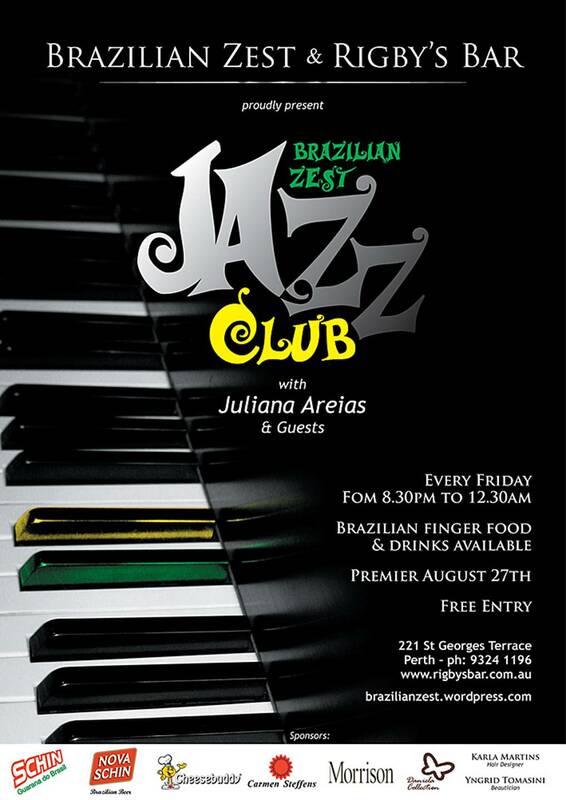 BrazilianZest Jazz Club@ Rigby’s Bar – Every Friday from 27 August 2010 to 22 October 2010. See Photos Produced by BZest. Jazz Brazil @ Gypsy Tapas House Court – Fri 6 August 2010 – Juliana Areias and Greg Howieson. Sponsor: Daniela Collection. Ginga Brazil Concert @ Kulcha – Fri 23 July 2010 – Juliana Areias, Glenn Rogers, Adam Springhetti and Marcio Mendes. Sponsors: Daniela Collection, Brazilian Zest, Central Park Hair Design (Juliana Mariotto), Yngrid Tomasini (make up design and photos), Giba Carvalho (photos) and Janine Abbott (video camera). 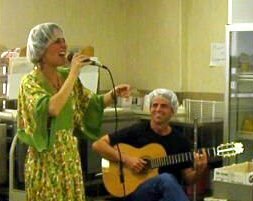 Soccer World Cup – Brazil X Portugal @ Rigby’s Bar – Fri 25 June – Juliana Areias Trio composed by Greg Howieson and Jose Henrique Alves. Sponsors: Daniela Collection, Kingston International College. Produced by BZest. Brazilian Folk June Festival – Festa Junina @ The WA Portuguese Club – Sun 20 June 2010. 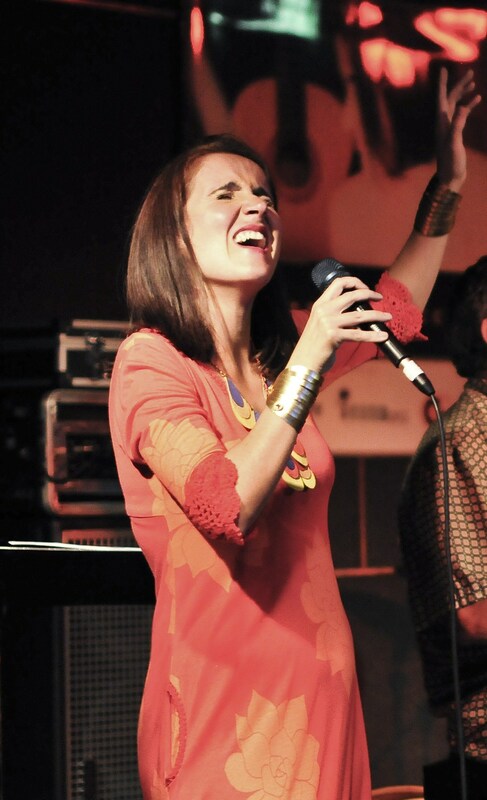 Juliana Areias and forro band composed by Jose Henrique Alves, Marcio Mandes, Tiago Santos and Tom Foss. Sponsors: Ocean One Bar, GeoAmazon, Kingston International College and Tiago Auto Service. Produced by BZest. World Music Showcase – Latin Fiesta @ North Bridge Piazza (Cnr Lake and James St) – Sunday 11 April 2010 – Funkalleros, So Brazil and Ancestrais Capoeira .Event promoted by The City of Perth and Kulcha Multicultural Arts of WA. Production: Zeroii Arts & Science. Sponsors: Daniela Collection and Totem. A night in Rio Concert @ Kulcha – Sat 27 March 2010 –So Brazil with Rick Golcalves and Rafa Golcalves. Event produzed by Zeroii Arts and Science. Sponsors: Daniela Collection and Juliana Mariotto ( hair and make up design artist). Harmony Week @ Mirrabooka Shopping Square Centre – Thurs 18 March 2010 – So Brazil. Production: Kulcha and Zeroii Arts & Science. Sponsors: Daniela Collection and Totem. Chilli Festival @ Esplanade Fremantle – Sat 13 March 2010 – So Brazil and Mike Boase. Production: Kulcha and Zeroii Arts and Science. Sponsors: Daniela Collection and Totem. The Havaianas’ Botequim – Sculpure by the sea exhibition – Cottesloe Beach – Thurs 10 March 2010 – So Brazil and Rick Goncalves. Production: Zeroii Arts and Science. Sponsors: Daniela Collection and Totem. Ocean One – Scarborough Beach – February, March 2010 –So Brazil. Production: Zeroii Arts and Science. Sponsor: Daniela Collection. The Kiosk – Floreat Beach -January, February, March 2010 –So Brazil. Production: Zeroii Arts and Science. Sponsors: Daniela Collection, Totem and Rick Studio Art. 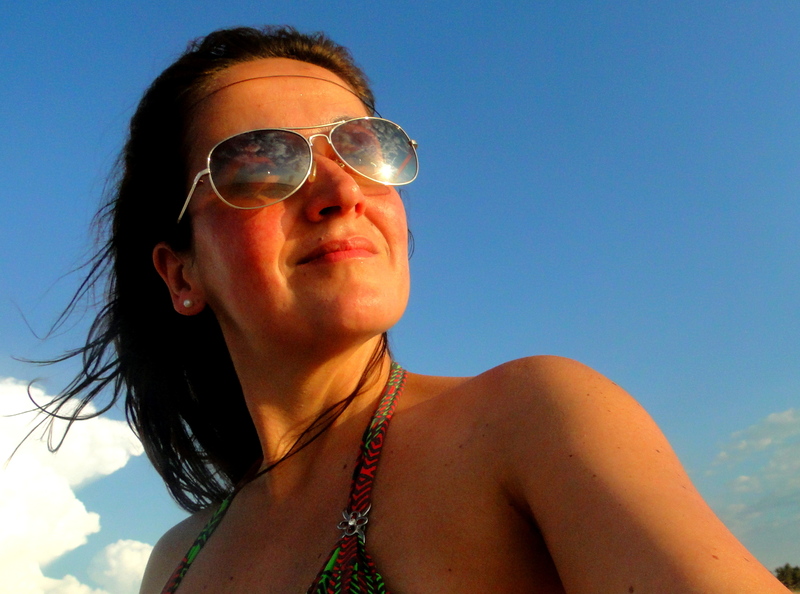 Salt on the Beach – December 2009, January 2010 – So Brazil. Production: Zeroii Arts and Science. Sponsors: Daniela Collection, Totem and Rick Studio Art. World Music Showcase – Midland -Sat 14 November 2009 – So Brazil. Production: Kulcha and Zeroii Arts and Science. Sponsors: Daniela Collection and Totem. Buddha Bar -October, December 2009 – Marcio Mendes, Rick Goncalves and So Brazil. Sponsor: Daniela Collection. St John of God Hospital -Wed 7 October 2009 – So Brazil. Production: Kulcha and Zeroii Arts and Science. Sponsors: Daniela Collection and Totem. Live at Woodsite -Mon 5 October 2009 – So Brazil. Production: Kulcha and Zeroii Arts and Science. Sponsors: daniela Collection and Totem. So Brazil Concert @ Kulcha – Multicultural Centre of WA – Sat 12 September 2009 – So Brazilwith Rick Goncalves and Adam Monk. Special participations: Eduardo Mello and JClas ( Luciana Negrao and Jonas Vianna). Production: Zeroii Arts and Science. Sponsors: Brazilian Zest, Daniela Collection, Totem, Juliana Mariotto ( hair and make up design artist), Adam Monk (photography) and Luciana Negrao ( video camera). 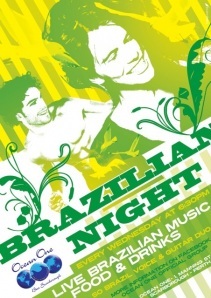 Romantic Brazilian Night @ Canton Lounge Bar – Sat 25 July 2009 –So Brazil. Realization: Brazilian Zest. Production: Roberta Oliveira Alves. Sponsor: Totem. Aquarela Trio Concert @ Kulcha – Multicultural Centre of WA – Fri 13 March 2009 – Juliana Areias, Robert Arathoon, Dominic D’Leno, Jeremy Poole-Johnson , Mike Collinson and Luciana Negrao.